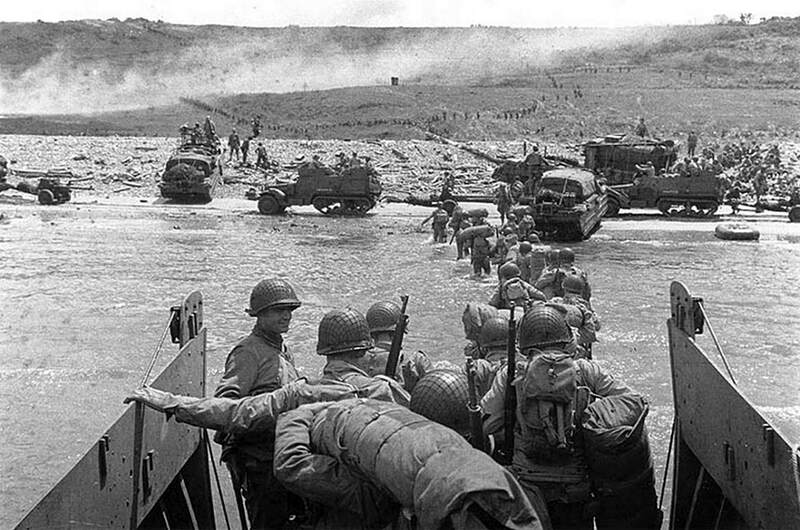 In complete contrast to the landings at UTAH, the Americans coming ashore at OMAHA met fierce resistance. 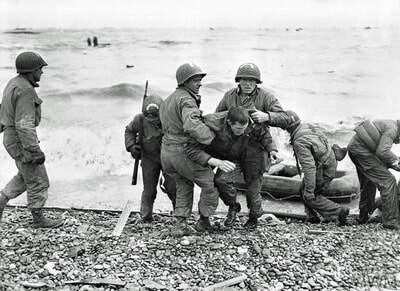 US losses during the now infamous assault were around 2,200 for around 35,000 military personnel landed by D-Day`s end. Many craft were hit on the way in and heavy machine-guns opened up on the hapless occupants just as the exit ramps dropped. The sea state caused tremendous problems too, making it difficult to manoeuvre as well as hiding many of the beach obstacles from view, thus hindering the engineers` attempts to diffuse attached mines and booby-traps. 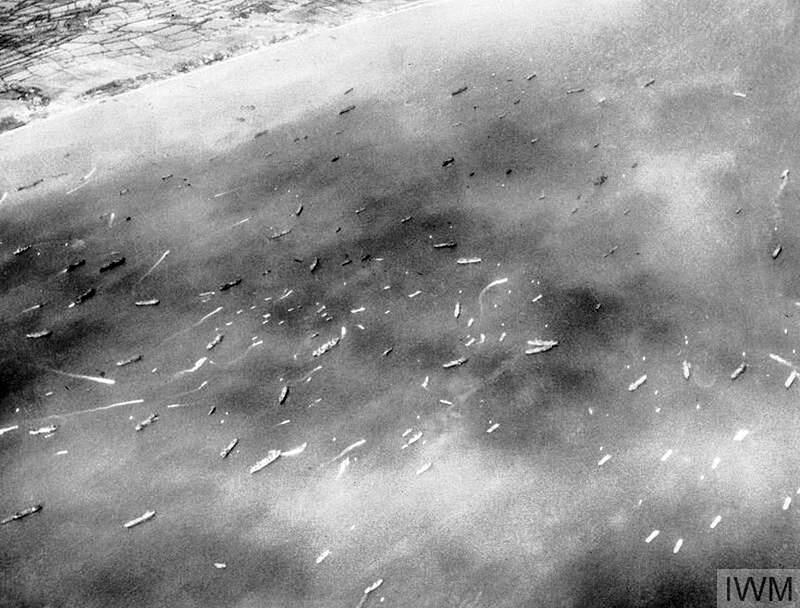 Even finding a space clear of debris and wrecks in which to get onto the sand frequently proved a challenge. 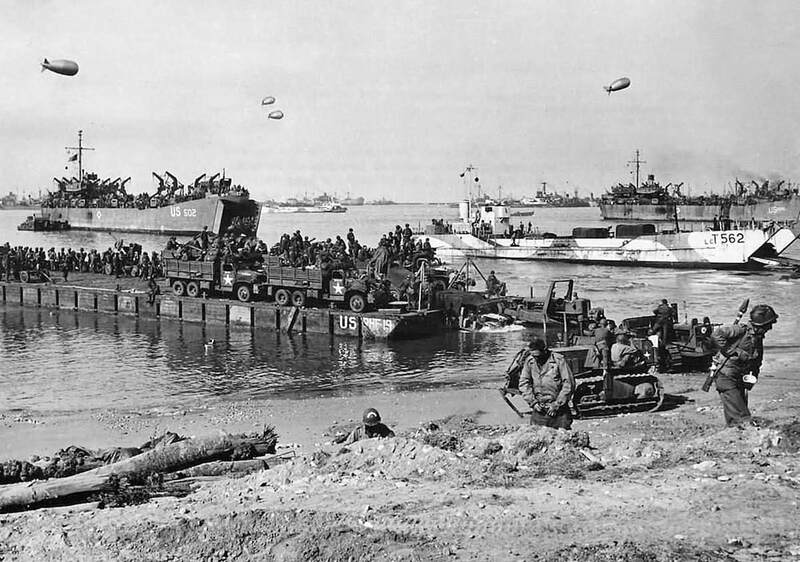 Some landing craft stuck fast on sandbars well offshore, while others were blown to bits or set afire by direct artillery hits. 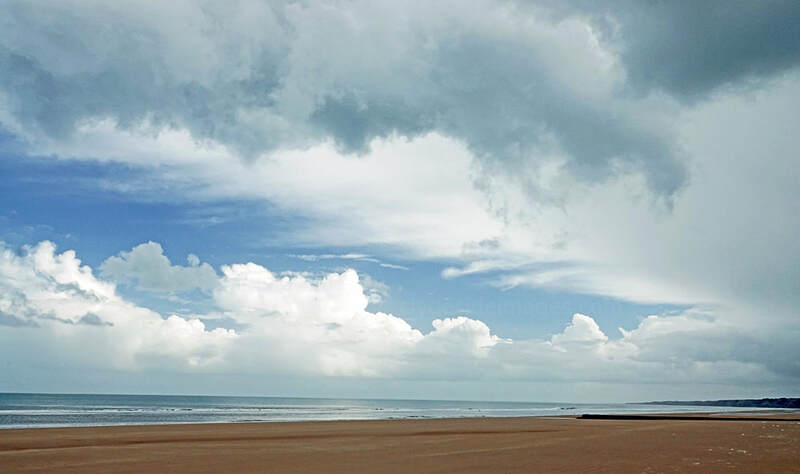 At low tide the gradual sweep of golden sand at OMAHA is fine but mainly firm, however, at high water usually only a narrow strip remains exposed. 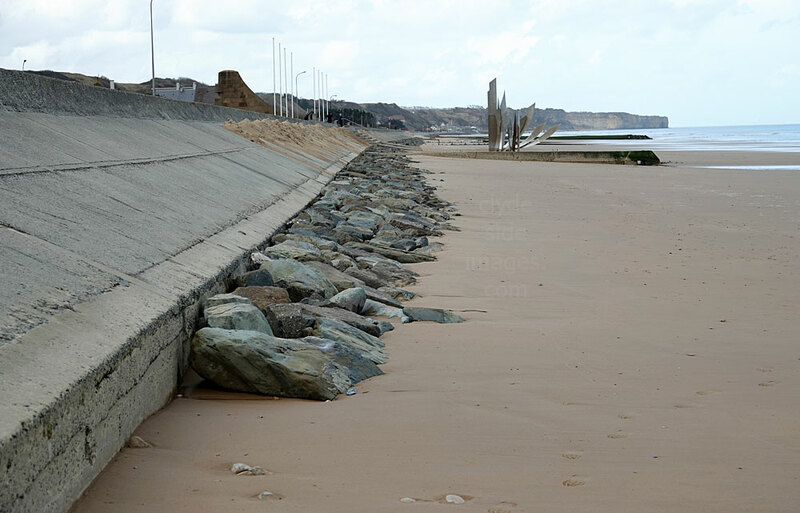 In 1944, one end of the beach comprised a large carpet of shingle which proved impassable for most types of vehicles, plus a part-wood, part-masonry seawall, long since demolished, between one and four metres in height, ran along the length of the western third. Immediately inland was a parallel promenade with a V-shaped anti-tank ditch, up to two-metres deep, on the far side. Marshy grassland then scrub protected the foot of the high ground, referred to as bluffs by the Americans, which rose to thirty-metres in some places. The following image shows landing craft carrying the first US assault waves heading towards Dog sector of OMAHA Beach, early morning on 6 June 1944. 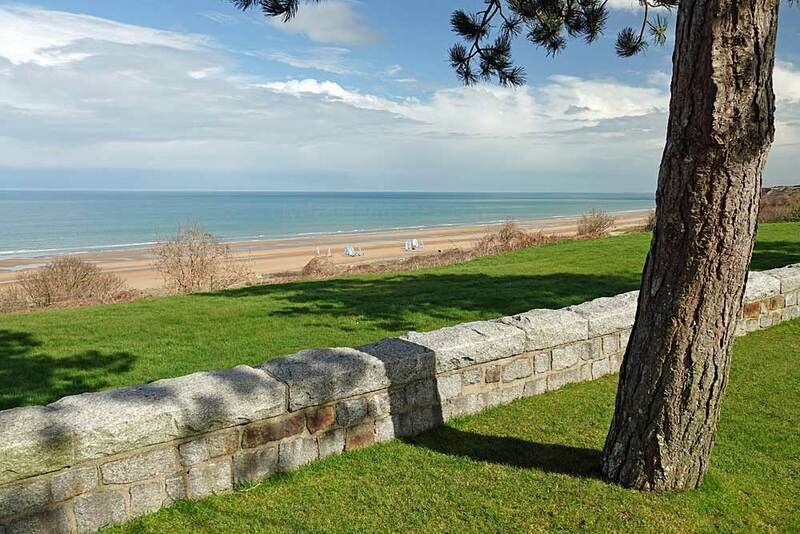 From west to east, three villages, namely Verville-sur-Mer, St Laurent-sur-Mer and Colleville-sur-Mer, occupy a 4.5 mile-long stretch of seafront at OMAHA. ​Once ashore here, vehicles could only gain the heights and vacate the beach via five steeply rising gullies or `draws`, entrances to all of which were well-protected by German minefields and formidable strongpoints including gun emplacements. Shortly before the first wave was due to storm ashore at OMAHA, bombers attacked the defences but due to low unbroken cloud cover, the planes dropped their loads too far inland leaving the enemy positions intact. The naval bombardment at dawn also had little effect because of the limited visibility. 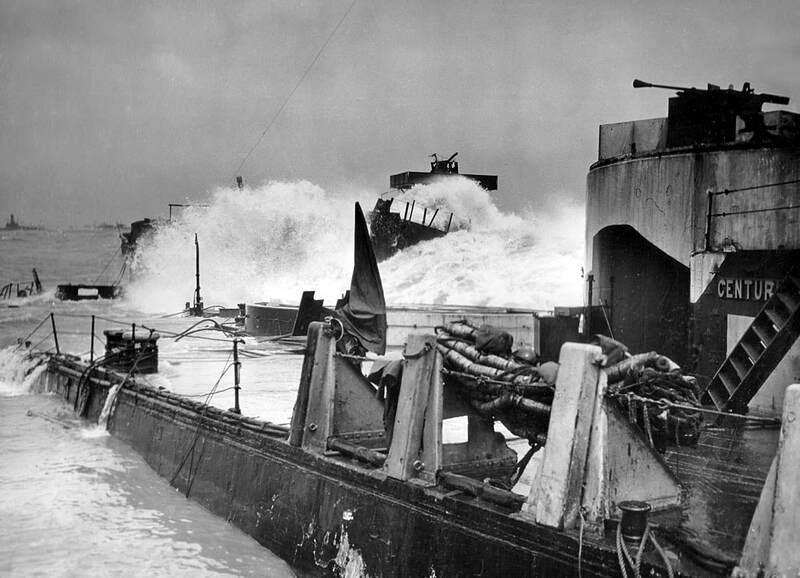 Landing craft were loaded and launched as planned 11 miles from the coast, which didn`t take the prevailing weather into account. The long final approach in stormy seas, made it an even tougher ordeal for those on board. Despite the rain, high winds and heavy swell, the decision was taken to launch the DD swimming tanks at 6,000 yards (5.5 kilometres). Despite the protection of their high canvas screens, many sank immediately with their crews trapped inside. Others were more fortunate and managed to swim clear to await rescue, but despite the almost inevitable outcome, no one decided to move in closer to shore and one tank after another joined the `launch lottery`. Of the 29 tanks that entered the water from ships at 6,000 yards, all but two sank, and the first batch of the smaller LCTs to reach the water`s edge got just three DDs onto the sand but all were disabled quickly. 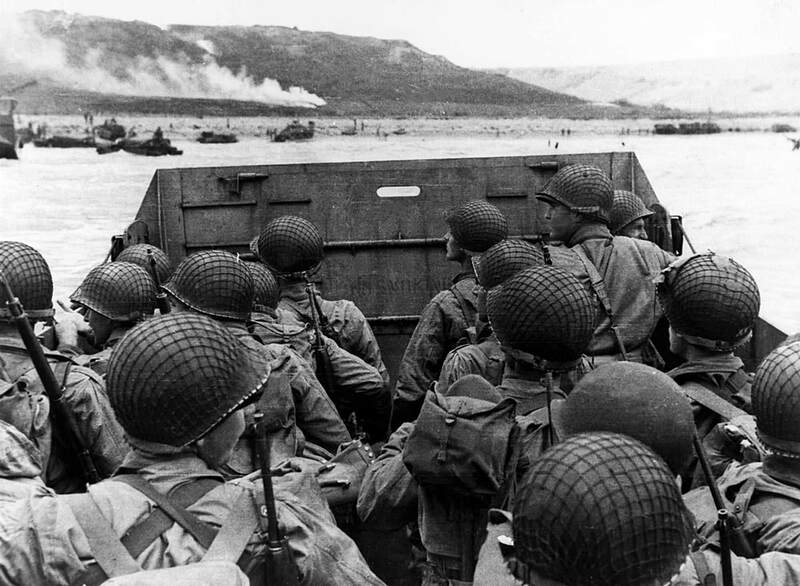 Above: US Assault Troops attempt to seek shelter from intense machine-gun and artillery fire as their landing craft nears the beach. 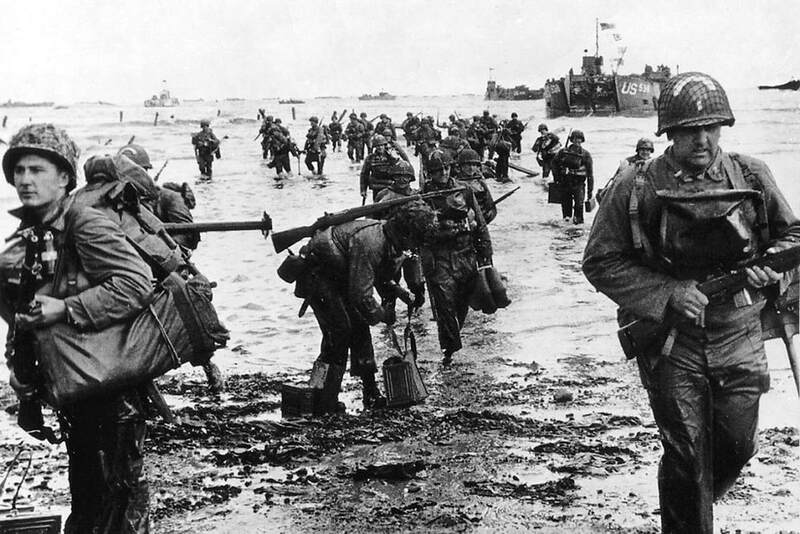 More men died on OMAHA than the three Commonwealth beaches combined but the bravery and tenacity of the troops and sailors overcame adversity and a handful of individual officers motivated the men when all seemed lost and inspired them to continue the assault against the seemingly unassailable German defences. 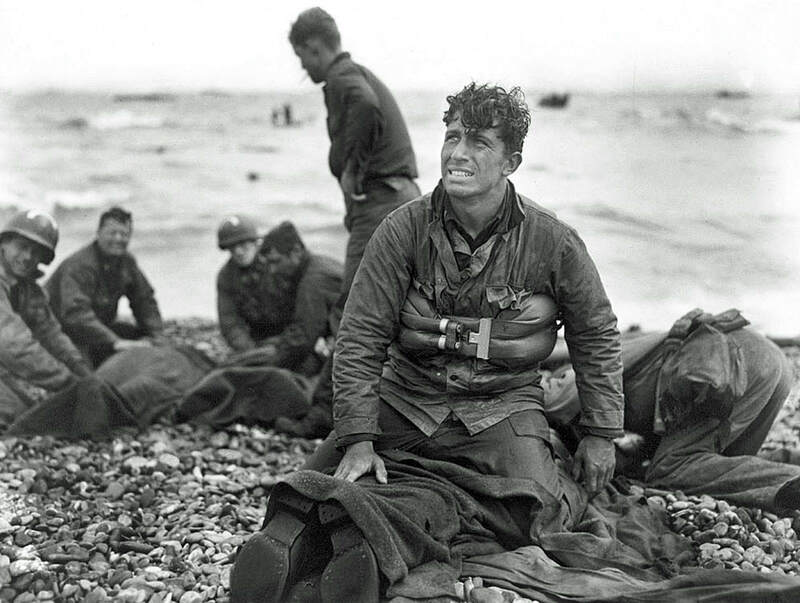 ​The most iconic images from the D-Day Landings are those taken by Hungarian war photographer and photojournalist Robert Capa (1913 – 1954) who opted to come ashore on OMAHA Beach with the 16th Infantry Regiment of the 1st Infantry Division in the second assault wave. Despite the surrounding carnage and constant machine-gun and artillery fire, Capa took 106 pictures, all but eleven of which were destroyed in a processing accident in the Life Magazine photo lab in London. The surviving images have since been called the Magnificent Eleven. Capa was equipped with two Contax II cameras each mounted with a 50mm lens and several rolls of spare film. His shots were all taken within the first 2 hours of landing after which he boarded the first available vessel and returned to England with the unprocessed spools. He immediately made his way to his London office where a staff member, in a hurry to see the finished negatives, set the dryer too high and melted the emulsion. 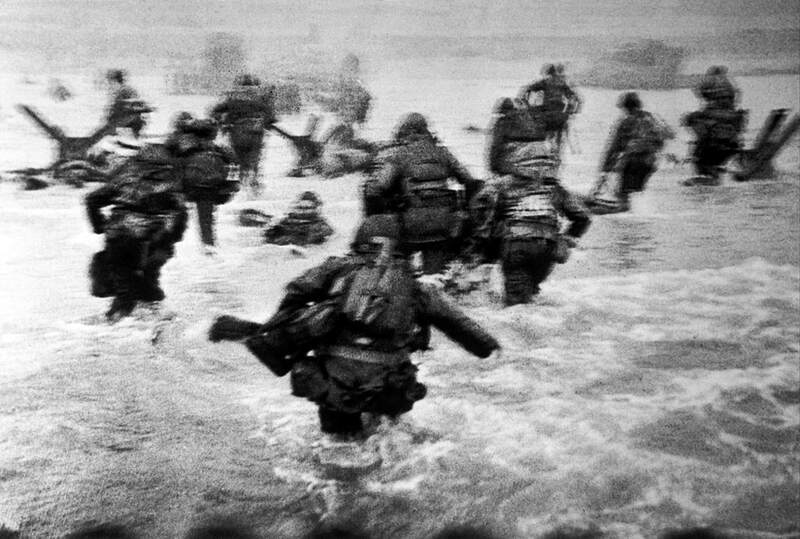 Life Magazine printed some of the surviving frames in its June 19, 1944 issue, "Beachheads of Normandy: The Fateful Battle for Europe is Joined by Sea and Air.". 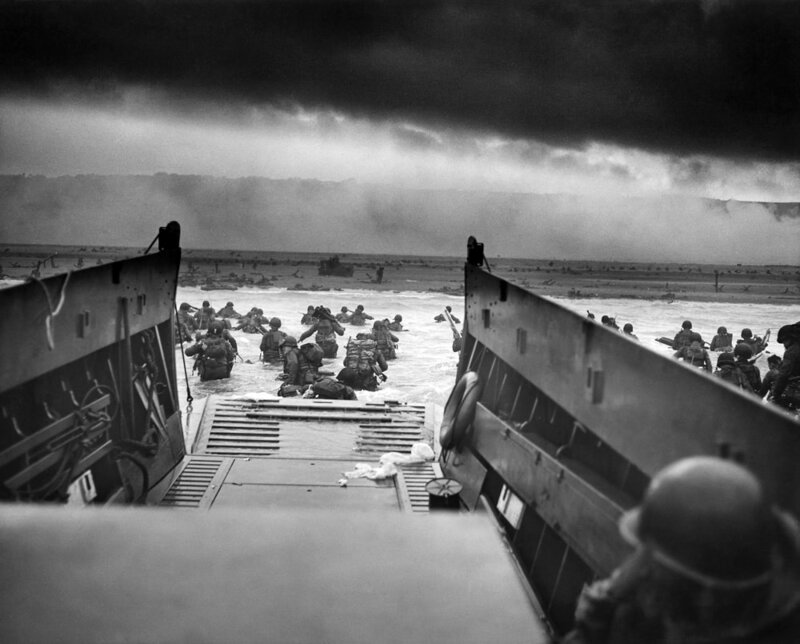 Men of a special joint Army-Navy engineer task force landed on OMAHA shortly after the first wave of infantry. 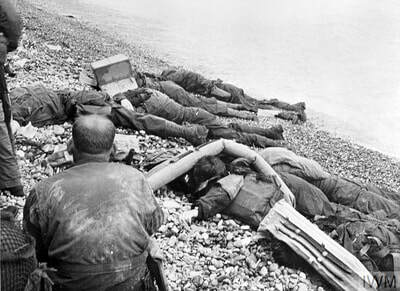 Their task was to clear sixteen channels, each 50 yards wide, through the beach obstacles. The combat demolition teams, however, arrived as incessant artillery, mortar, and machine-gun fire was taking a heavy toll of those already ashore or fumbling about in the water. Many troops, like those above, were desperately sheltering behind the very obstacles that the engineers were tasked with destroying. The beach at St Laurent-sur-Mer today. 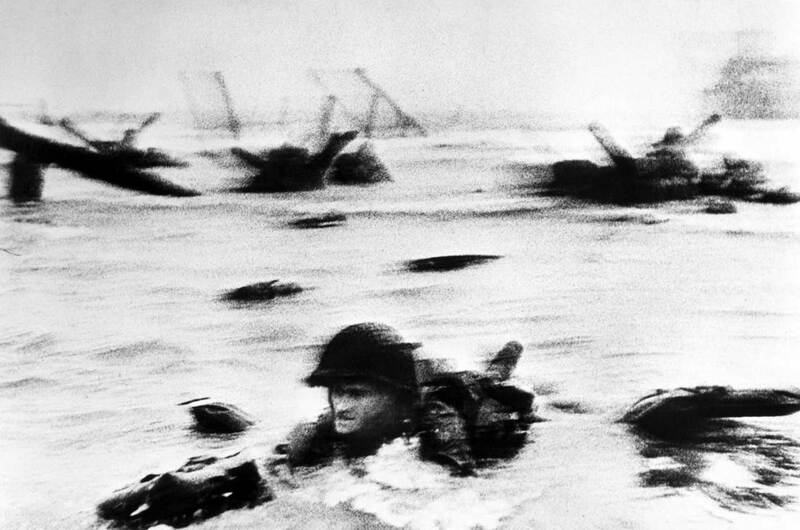 Most of the surviving images taken by Capa were blurred and grainy such as the one above left, but were more dramatic as a result. 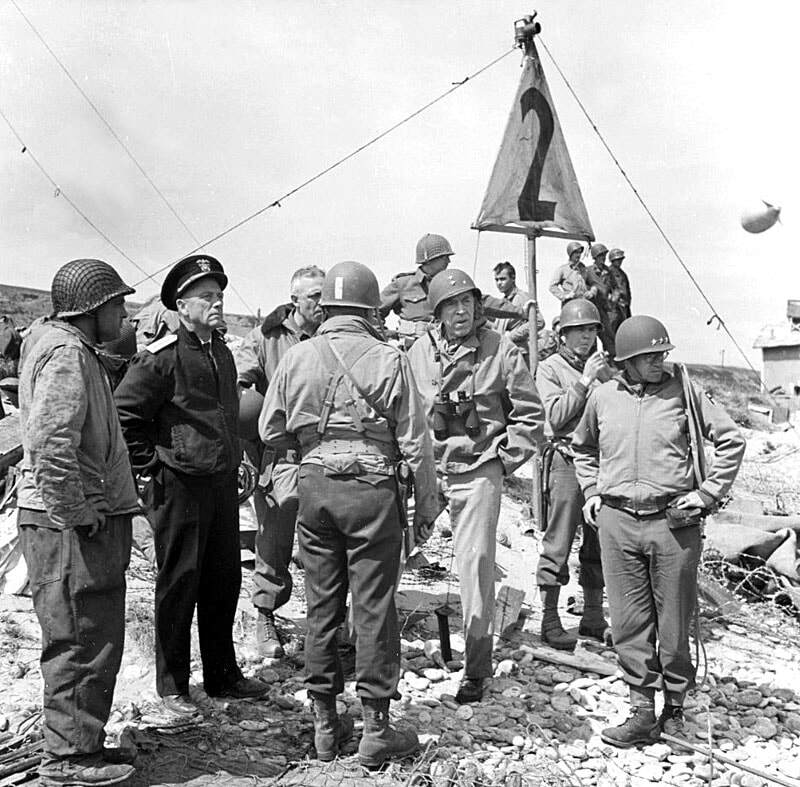 ​Major General Leonard T. Gerow (3rd on the left) (13 July 1888 - 12 October 1972), commanded the US V Corps which was responsible for capturing and securing the OMAHA Beach sector. He is pictured along with other American Overlord commanders, including Rear Admiral John L. Hall Jr. (2nd left), The above shot was taken on board a vessel during a training exercise off the south coast of England shortly before D-Day. 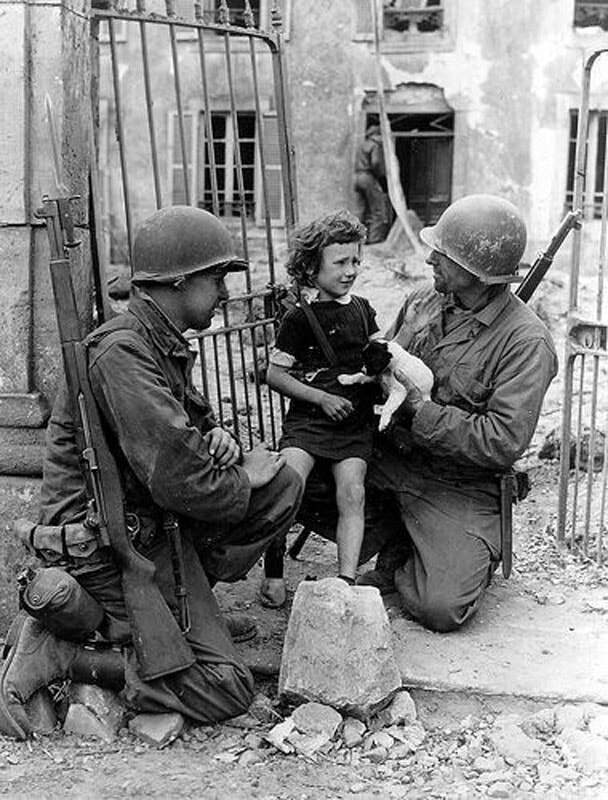 More troops arrive at OMAHA: The objective for Gerow`s forces was to secure the beach then link up with the British at GOLD on the left, push inland to meet with the men of the US Airborne around Carentan, which by this time were widely scattered across the base of the Cotentin Peninsula, and link with the ground forces moving in from UTAH Beach. On the morning of June 6th, the adverse weather had blown many of the landing craft off course which caused considerable confusion and meant that Regimental Combat Teams were split up, some with their vital equipment unloaded at a different location. Above: USS Augusta (CA-31), a Southampton-class heavy cruiser, served as the flagship of the Western Task Force during the D-Day landings. 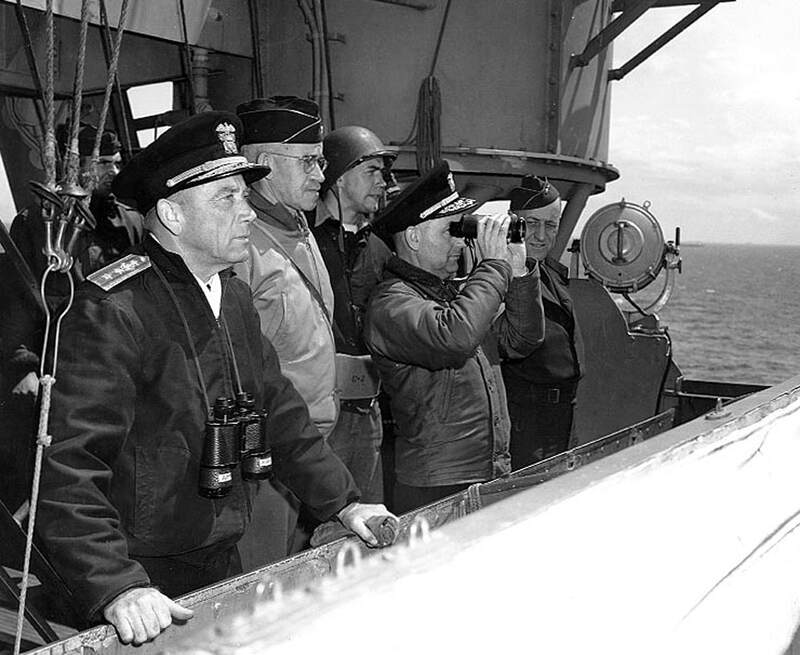 She sailed from Plymouth on 5 June with General Omar Bradley (2nd left) and other senior officers on board. At 06:18 hrs on the morning of 6 June, she engaged German shore installations at OMAHA Beach with her main 8-inch guns, firing 51 shells. Some of the targeting information was provided by the pilots of Supermarine Spitfire VBs and Seafire IIIs of VOS-7, a U.S Navy Spotter Squadron. 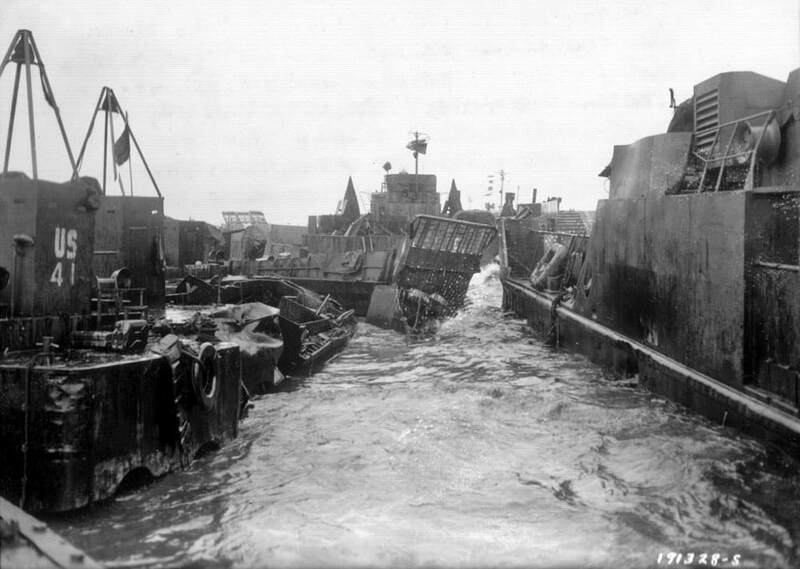 The above photo shows LCI(L) 85 taking in water off OMAHA on D-Day. The crew of this fatally hit Coast Guard craft had evacuated wounded troops from the carnage on the beach and transferred them to a waiting transport ship then pulled away. Shortly after this shot was taken, the LCI toppled over and sank, but fortunately all the crew were rescued from the water. The above photo from the US National Archives was taken in England during a training exercise shortly before the invasion, but even though the conditions were made as realistic as possible, it could not prepare the troops for the chaotic, terrifying and gruesome scenes encountered when they assaulted OMAHA Beach on D-Day. More shots taken with my bridge camera from the American Cemetery: The clear fields of fire the defenders manning strong points on the bluff benefited from is apparent in these views. ​A further major threat to the landings were the gun batteries at Point du Hoc (below) and Grandcamp-Maisy, both of which were capable of wreaking additional havoc on both UTAH and OMAHA beaches. To ensure success these objectives were allocated to American Ranger units. (see above links) rather than have bombers or naval guns attempt to obliterate the well protected site. 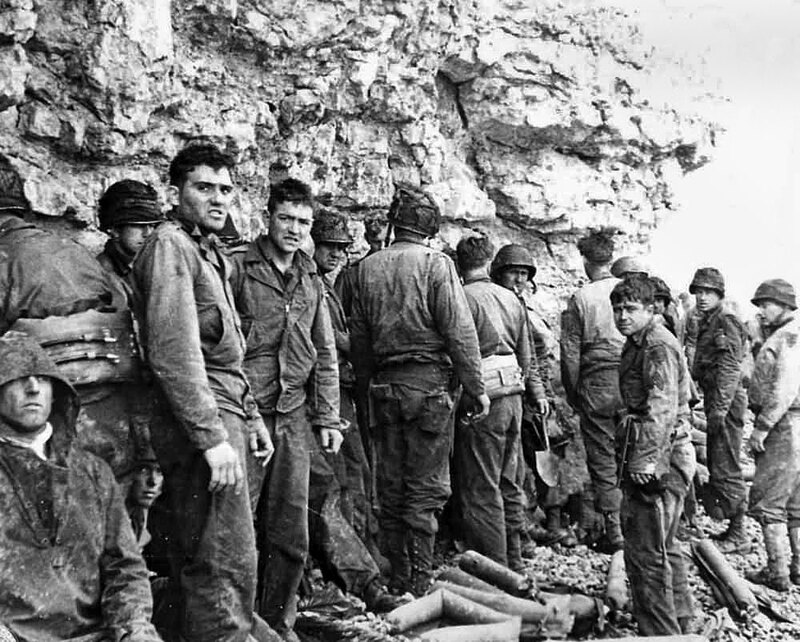 A second Ranger force comprising eight companies had been set to follow and reinforce the first wave at Point du Hoc if flares confirming a foothold had been fired from the plateau. 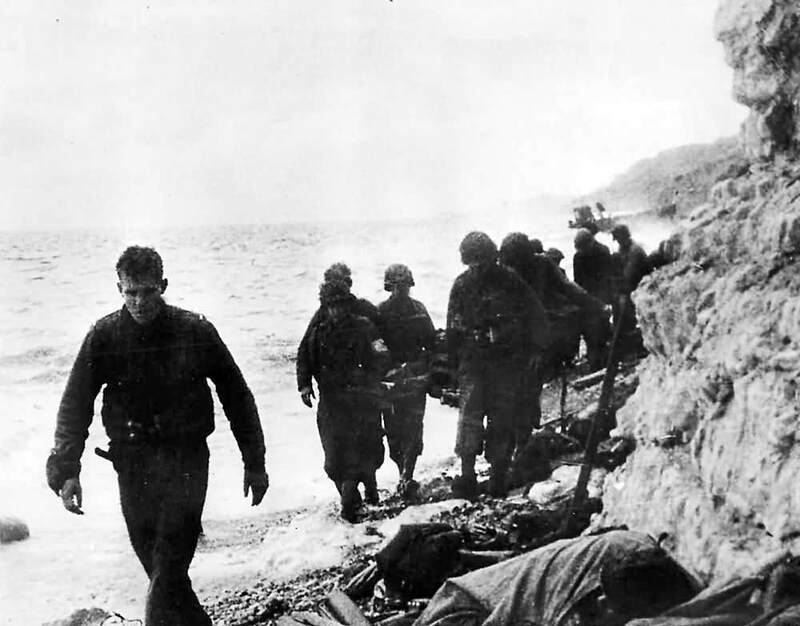 The initial wave arrived behind schedule and although many of the men managed to scale the cliffs, they faced fierce resistance and their hold was tenuous. 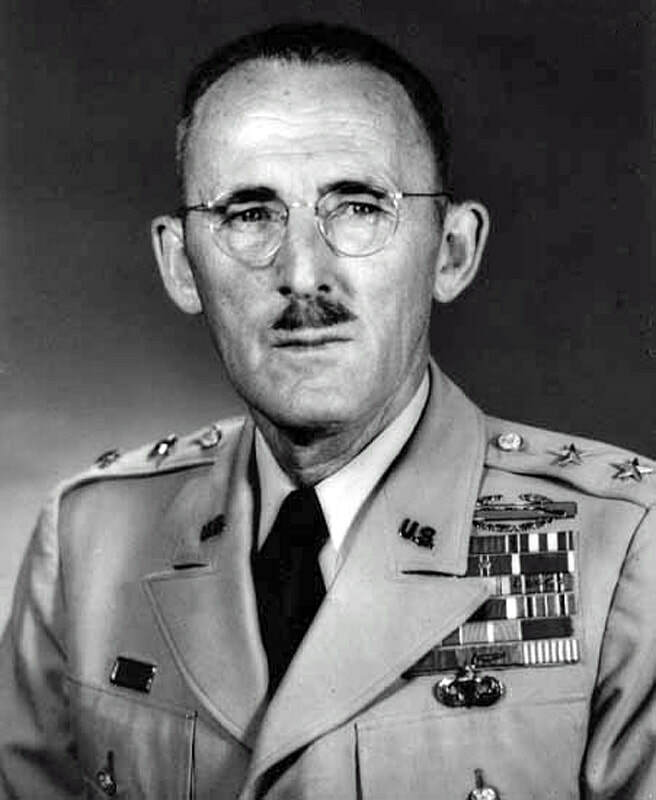 As a result the success signal was not given on time, so the second wave, totalling some 500 men, assumed the attack on the Point had failed and rerouted to OMAHA, which was the backup plan in the event of such circumstances. The Rangers` arrival at OMAHA, close to the Vierville draw, gave the beleaguered infantry already on the beach badly needed additional firepower and the Rangers assisted in opening exits and tackling the German defences. The irony is that had the second batch landed at Pointe du Hoc as intended, the casualty rate on OMAHA would likely have been even more horrendous than it already was. Covering the landing area at OMAHA were fifteen Weiderstandnest (WN-60 to WN-74) equipped with anti-tank weapons, ranging in calibre from 47mm to 88mm, plus 20mm flak guns, fixed turrets from obsolete French tanks, mortars and numerous machine-gun positions. Most of the latter were equipped with the MG34, not the latest model, but a highly a capable killing machine none-the-less, potentially capable of firing up to 1,200 rounds per minute. It`s thought that there were at least 85 of these weapons available to the defenders alone. 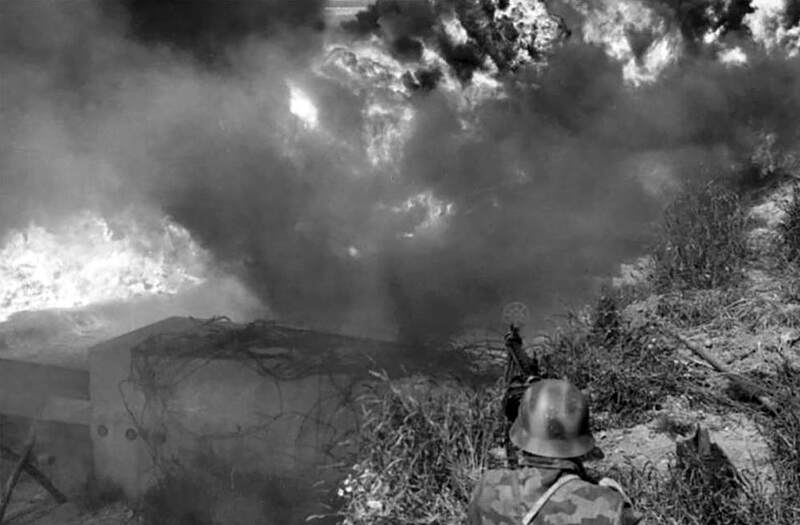 Artillery observers on the coast could call in devastating fire from the big guns positioned well inland, plus there were the minefields, anti-tank ditches and barbed wire. Nowadays, although the ground immediately inland at Saint Laurent-sur-Mer has modern-day housing, with trees and thick vegetation covering the hillside beyond, the steep nature of the terrain, heavily defended on D-Day, has not changed much and emphasises the daunting task facing the troops who landed here. ​Capturing the villages of St Laurent, Verville-sur-Mer and Colville-sur-Mer proved problematical with the stone houses acting as strongpoints along with the purpose-built concrete pillboxes and Tobruks. All three settlements were only taken after tough, lengthy fighting - mopping up was slow, dangerous work. Three of the officers providing crucial leadership at OMAHA early on 6 June 1944 were Major General Charles D. W. Canham (January 26, 1901 - August 21, 1963) (below left) commander of the 29th Div`s 116th Infantry Regiment, Colonel George Arthur Taylor (February 14, 1899 — December 3, 1969) (centre) the commander of the 1st Div`s 16 Infantry Regiment, and Brigadier General ​Norman Daniel "Dutch" Cota, Sr. (May 30, 1893 – October 4, 1971). 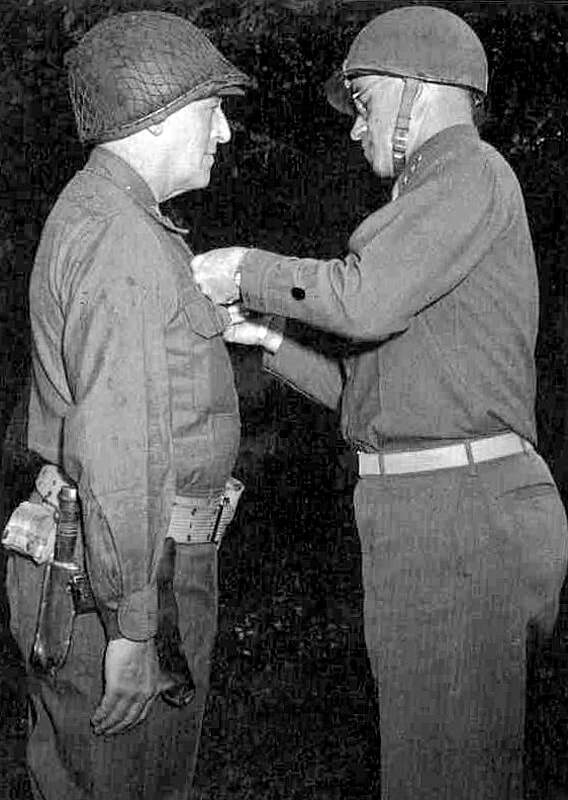 The US Army image on the right below shows General Omar Bradley awarding Cota with the Distinguished Service Cross for the leadership and courage he displayed on D-Day. Taylor also earned the same decoration. This orientation panel is located on the edge of the American Cemetery. 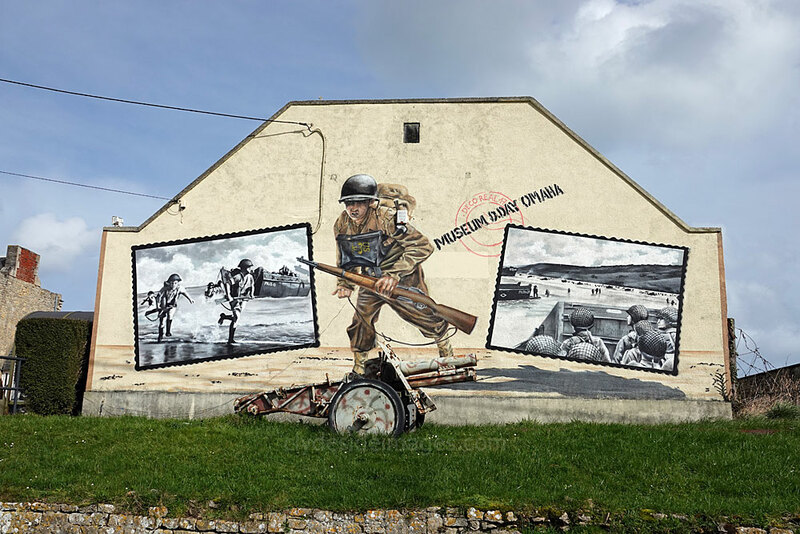 Canham and Cota landed on the OMAHA sector known as Dog White with the headquarters group of the 116th Infantry Regiment in the second wave, approximately one hour after the first troops came ashore. 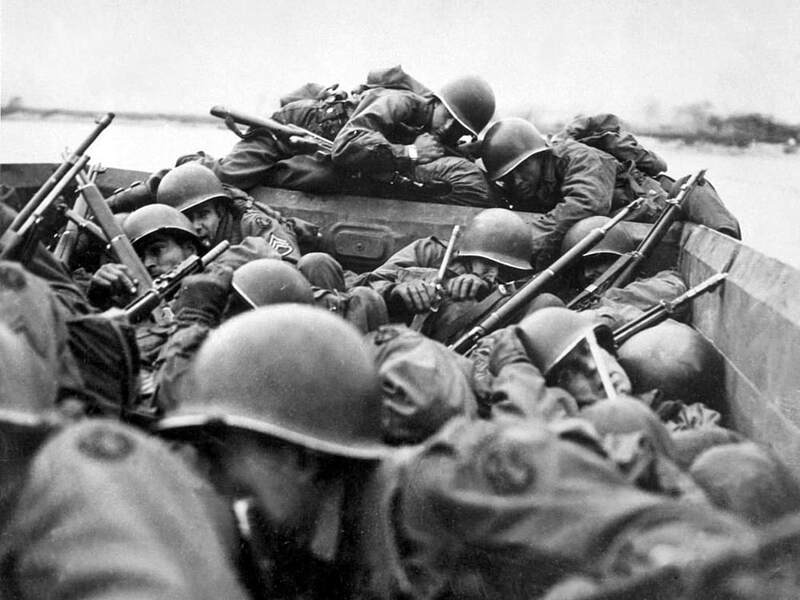 The HQ group`s landing craft came under heavy fire and three soldiers were killed immediately upon disembarkation. Canham and Cota swam, then waded through the surf and took shelter behind a tank momentarily before making a dash for the sea wall. Cota identified a suitable draw, organised covering fire, and supervised the placing of Bangalore torpedoes to blow gaps in the wire. Small groups of Rangers did likewise and under the cover of the smoke of battle and burning grass the first of the men charged uphill but was mortally wounded. Sensing hesitation on the part of the others, Cota led the way and a single file of riflemen followed him onto the high ground and took on the enemy strongpoints from the rear. ​By this time, all along the beach, progress was being made, albeit at great cost. 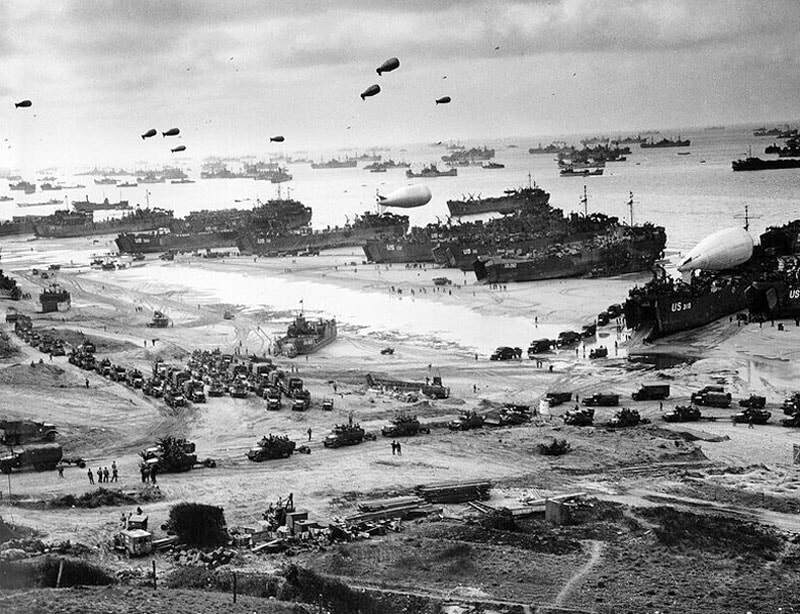 ​Two hours after the initial landings, large areas of beach were a mass of wrecked vehicles, scattered equipment and other debris, as additional laden down troops hurried ashore. The sand was littered with bodies while others rolled about in the surf. Control offshore was a nightmare too with planned landings way out of sequence. This meant that unsuitable vehicles such as Jeeps had been landed before the tanks but now armour was starting to make a difference. Those temporarily disabled acted as stationary gun platforms while crew members, showing great courage under a hail of incoming fire, replaced damaged tracks. The course of the battle gradually swung in favour of the attackers. 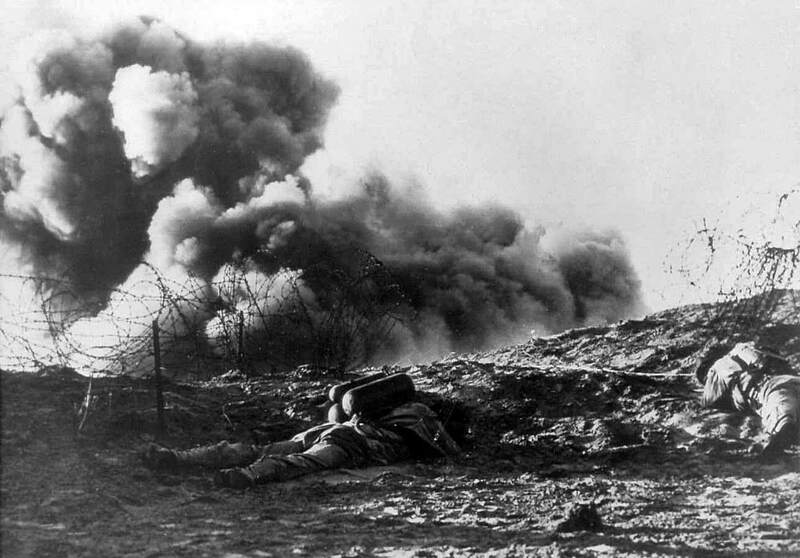 In one case, combat engineers managed to drive a truck loaded with TNT so close to the wall of a pillbox that when it detonated the German occupants all died instantly from concussion. Communication with the warships offshore picked-up and British and US destroyers sailed ever closer to the congested waterfront to improve the accuracy of their bombardments. Many of the ground troops later commented that "it was the Navy that saved the day". Fire from these smaller ships had proved far more effective in neutralising defences than heavy shells hurled from the battleships well out to sea. By 11:00 hrs things were noticeably better. 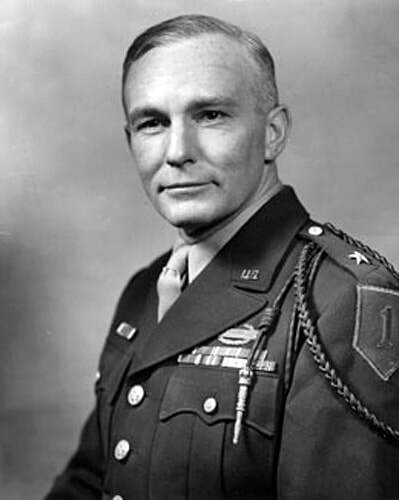 Brigadier General Cota was atop the bluff, encouraging his men to advance further and led a mixed formation of infantry and Rangers as they worked their westward, flanking machine gun positions covering the Verville Exit. The Germans withdrew and other groups appeared, including Colonel Canham`s and slowly but surely, one by one, the resistance nests fell with many enemy troops opting to surrender. 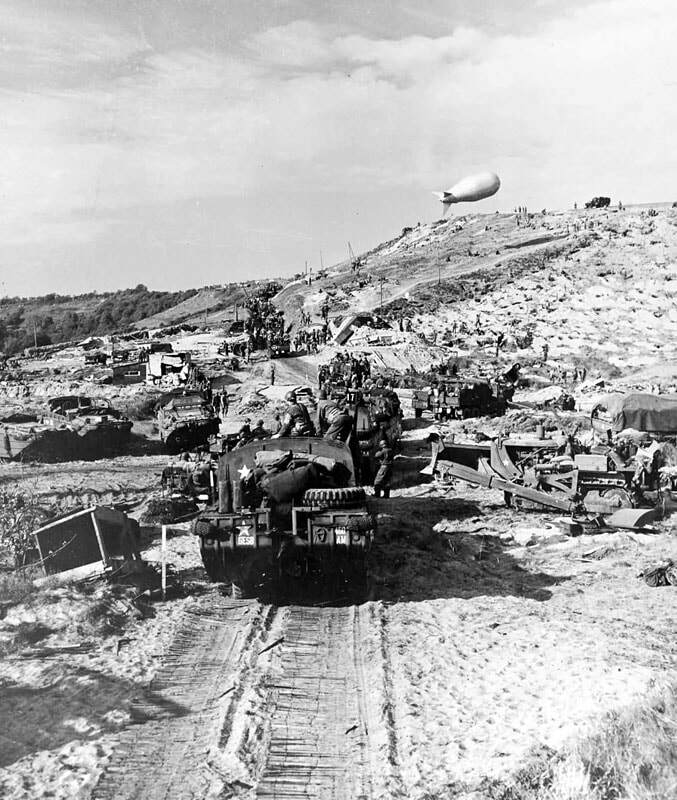 Mines were responsible for numerous casualties and as fake minefields were difficult to distinguish they slowed progress just as much as the real thing, By 12:30, however, the Americans had landed almost 19,000 troops on OMAHA and the first tanks reached the heights. 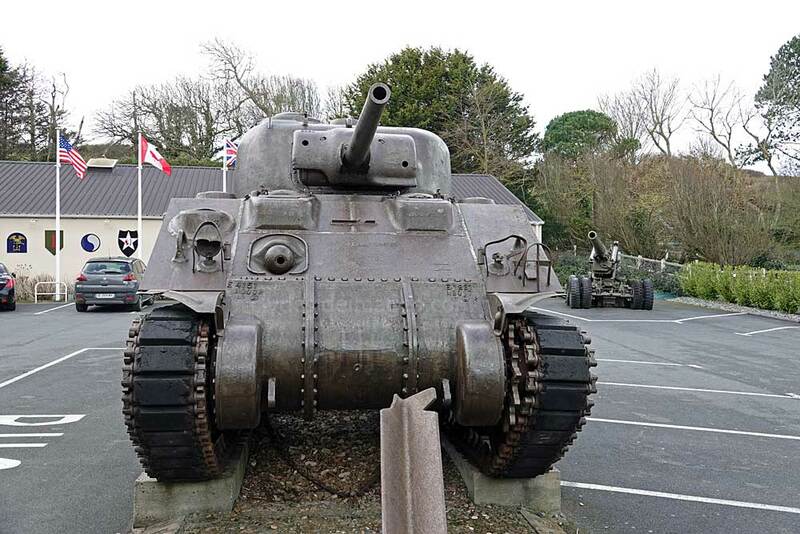 Colville-sur-Mer proved difficult and elements of the 1st Division bypassed it while their comrades engaged the defenders. 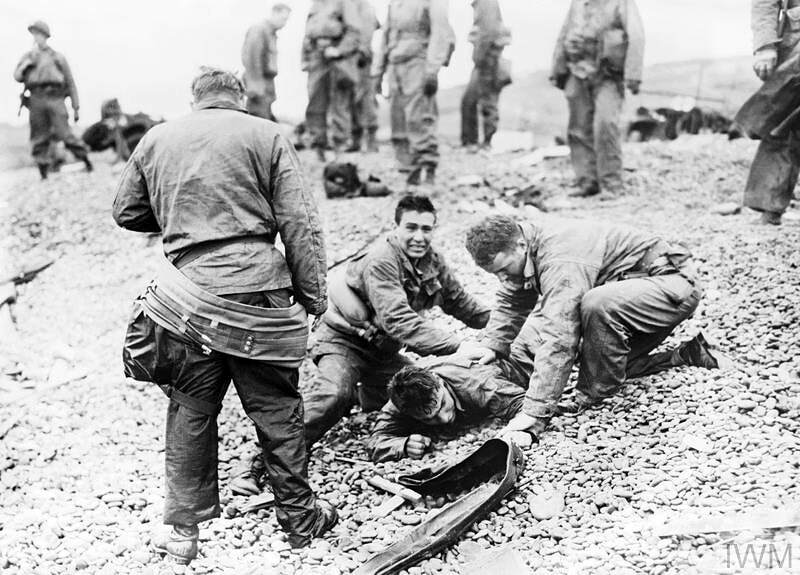 The above shots show men of the 16th Infantry Regiment, 1st Division on OMAHA Beach assisting wounded comrades. 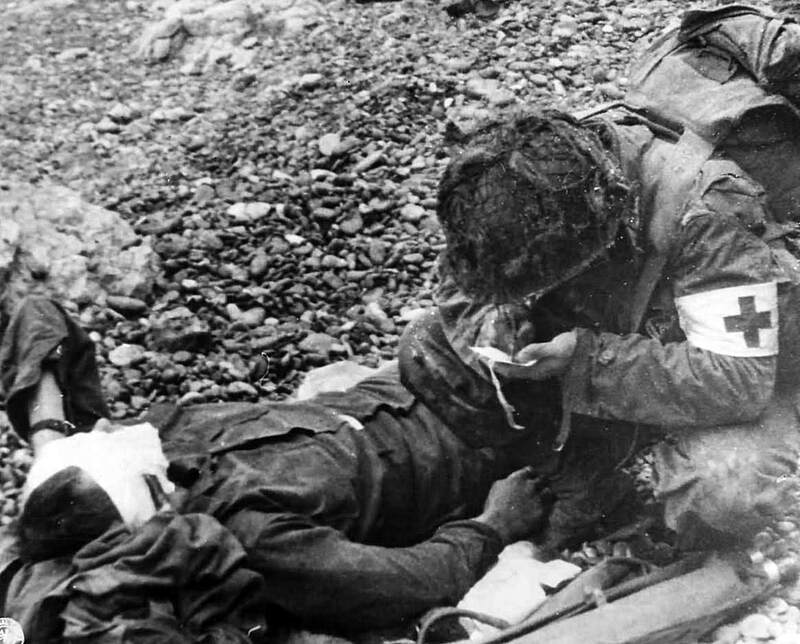 Medics showed great courage sacrificing their own safety to administer first-aid. Often they could do little more than administer morphine and patch up flesh wounds but of course many casualties were beyond hope. 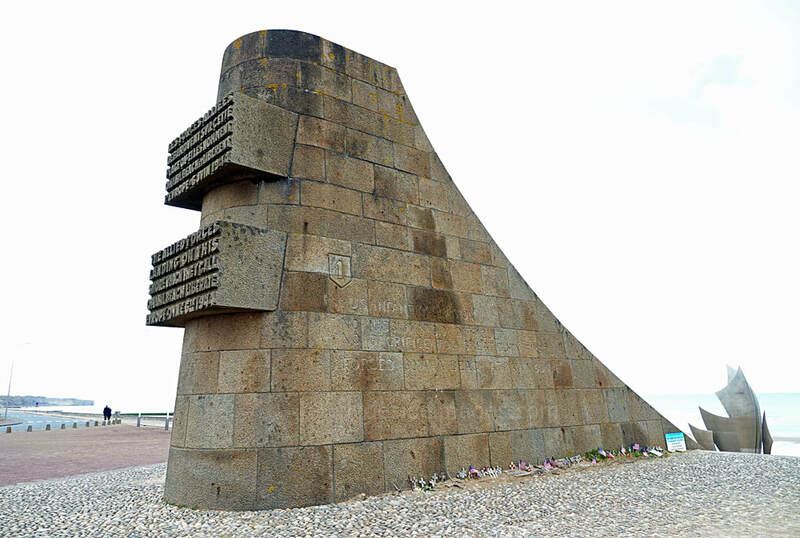 Above: This is the D-Day Memorial at St Laurent-sur-Mer, one of ten signal monuments designed by Yves-Marie Froidevaux, situated at various locations along the landing beaches. This one marks the dividing line between Dog and Easy sectors and is at the bottom of Exit D3, les Moulins. There are a number of additional memorials in this area. 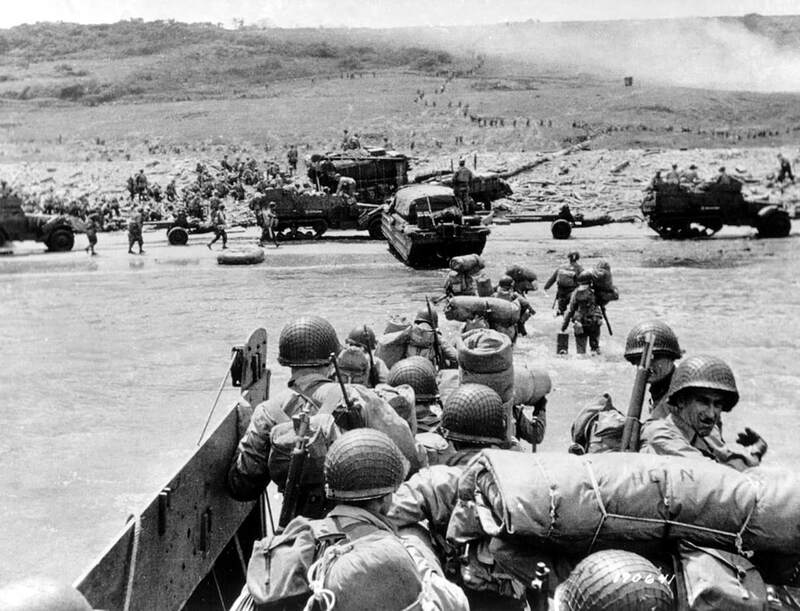 The inscription on the front, in English and French, reads, `The Allied Forces landing on this shore which they call OMAHA Beach Liberate Europe - Jun 6th, 1944.` The high ground beyond was among the areas bitterly contested on 6 June 1944. One side of this monument pays tribute to the US 1st Division, The Big Red One`: US 1st Infantry Division: No Mission too difficult, No sacrifice too great. Duty First. Forced OMAHA Beach. 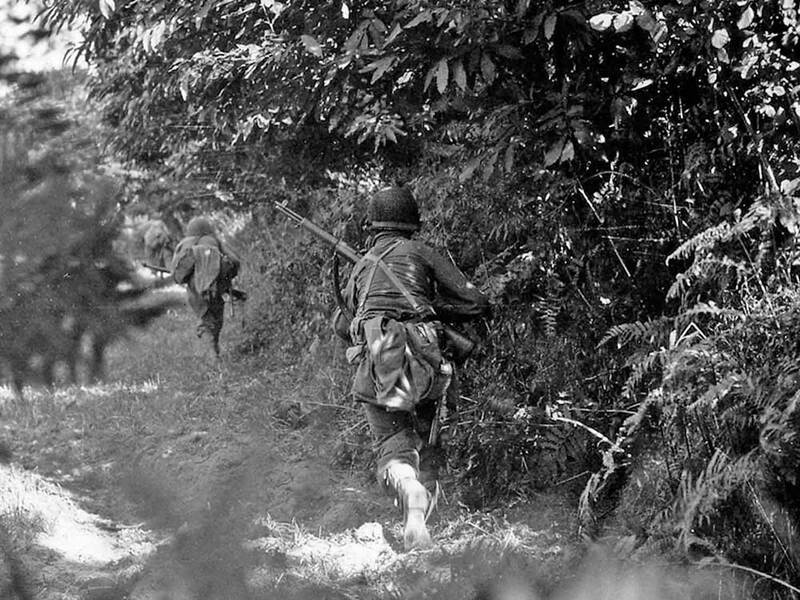 6 June 1944.` ​The opposite side honours the 116th Infantry Regiment of the 29th Infantry Division. 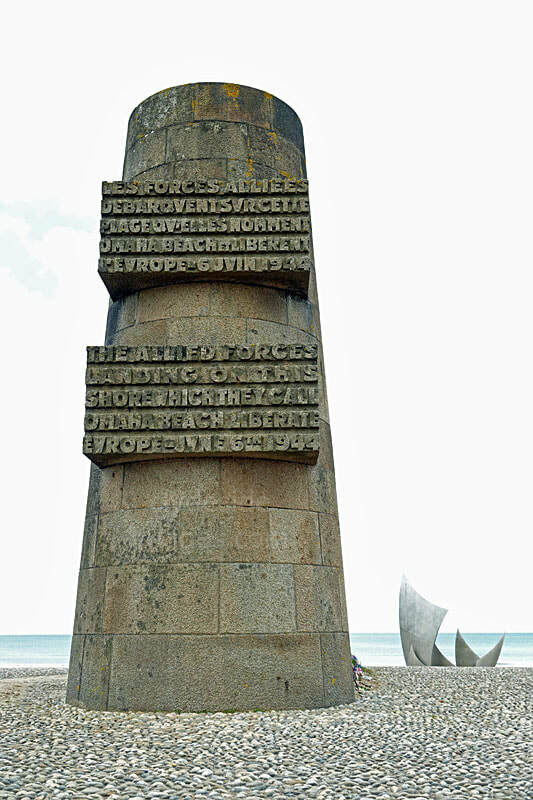 Also at St Laurent, an situated on the sand directly behind the signal monument, is Les Braves, a memorial commemorating the American soldiers who lost their lives on the beaches of Normandy on June 6th 1944. 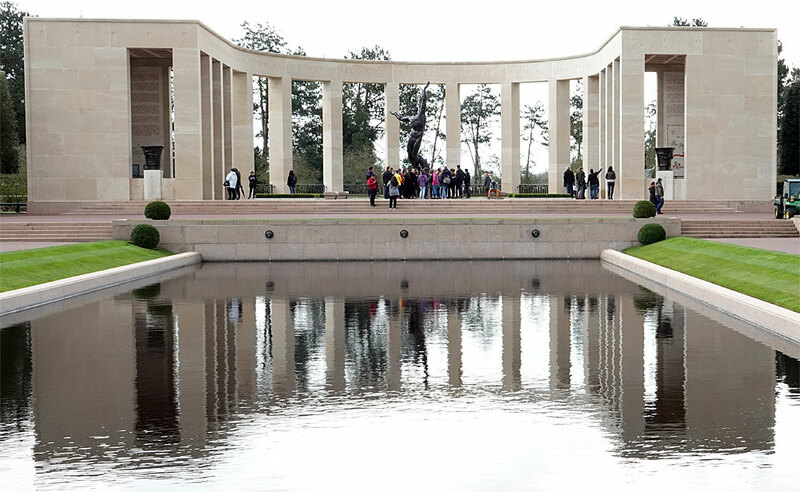 A creation of French sculptor Anilore Banon, the memorial was commissioned by the French government to commemorate the 60th anniversary of the D-Day Invasion. The seven curving stainless steel columns, the tallest of which is 30 ft (9m) high, represent three elements: The Wings of Hope, the Rise of Freedom, and the Wings Of Fraternity. 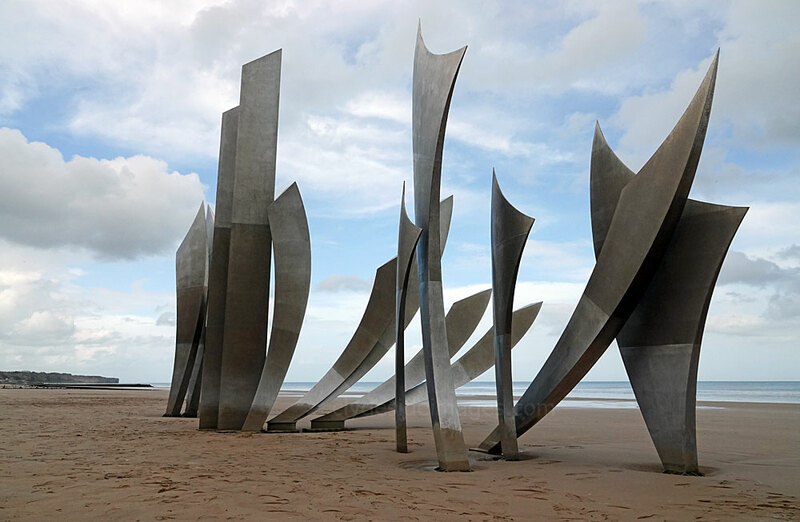 Intended only as a temporary art piece, the sculpture still stands on the shores of Omaha Beach mainly due to widespread public support. The creation has been described as a blend of art and nature and has withstood exposure to the elements remarkably well. 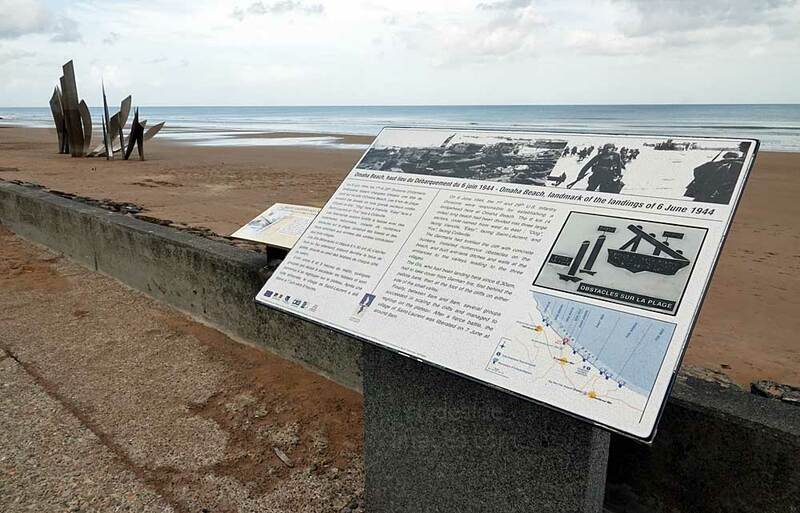 Panels fixed along this stretch of coast provide information on the battle and the men who fought here. 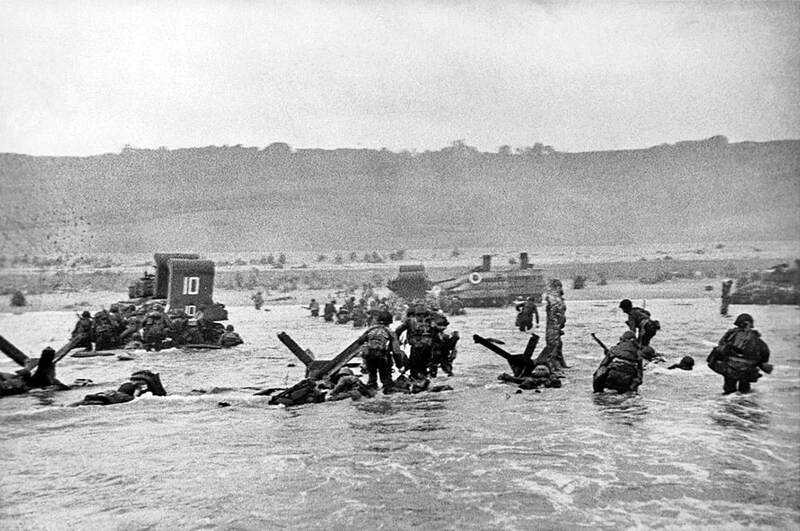 ​OMAHA Beach on the afternoon of 6 June 1944. 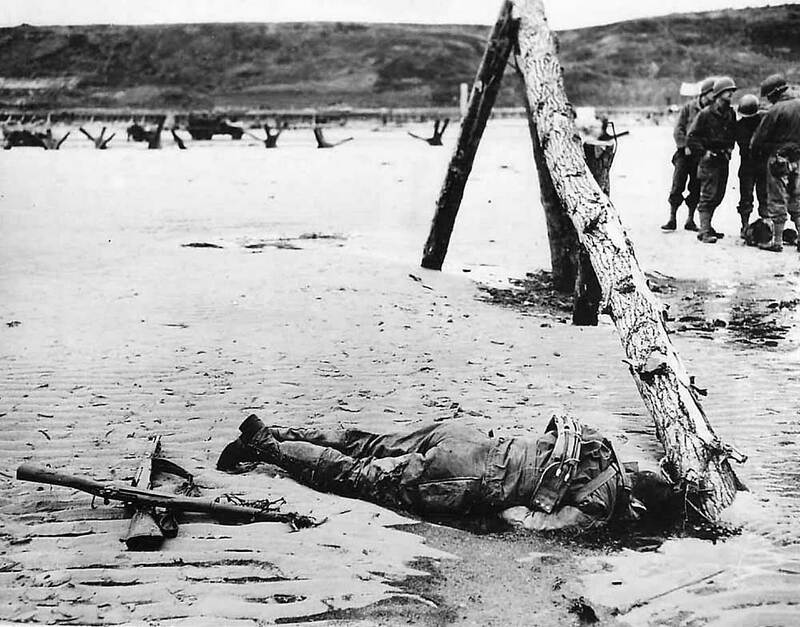 Bodies of US troops still lie on the sand as do knocked-out vehicles including a DD Sherman. 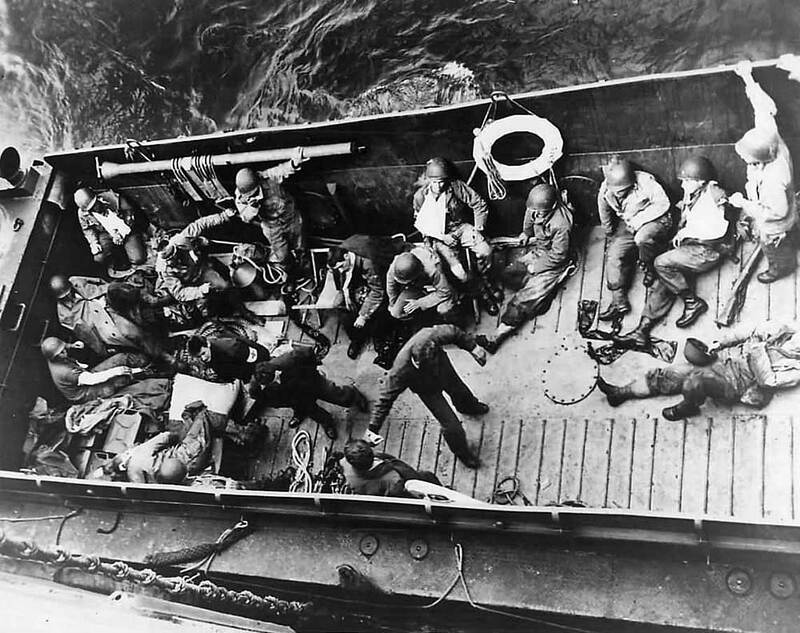 OMAHA from the air and wounded ​US Troops, casualties from the initial landings, are evacuated on an LCM (Landing Craft Mechanised). Once they started to advance warily across the higher ground, the mostly inexperienced GIs soon found themselves in typically-Norman hedgerow and orchard country with well concealed enemy positions often difficult to locate. 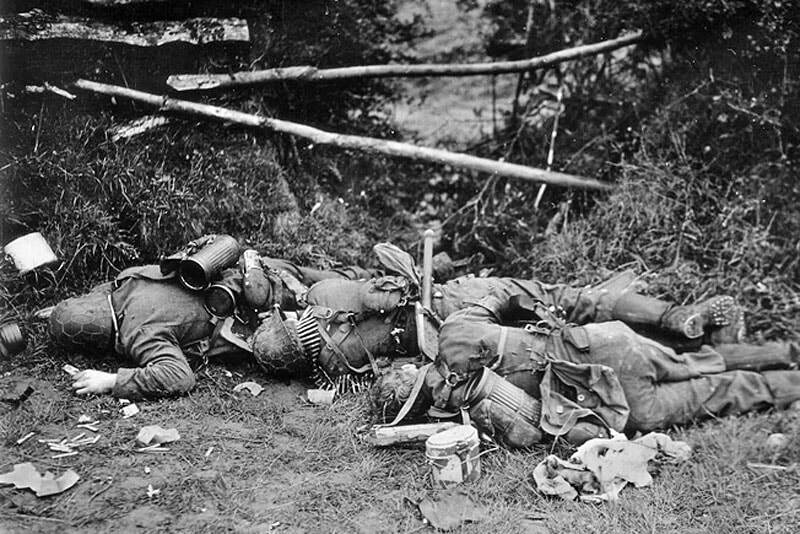 Many Germans or Ost Battalion soldiers doggedly remained at their posts until they were overrun, rather than withdraw to regroup further inland for a possible counterattack in strength. Nevertheless, the Americans were prevented from progressing more than a few kilometres and their casualties continued to mount. 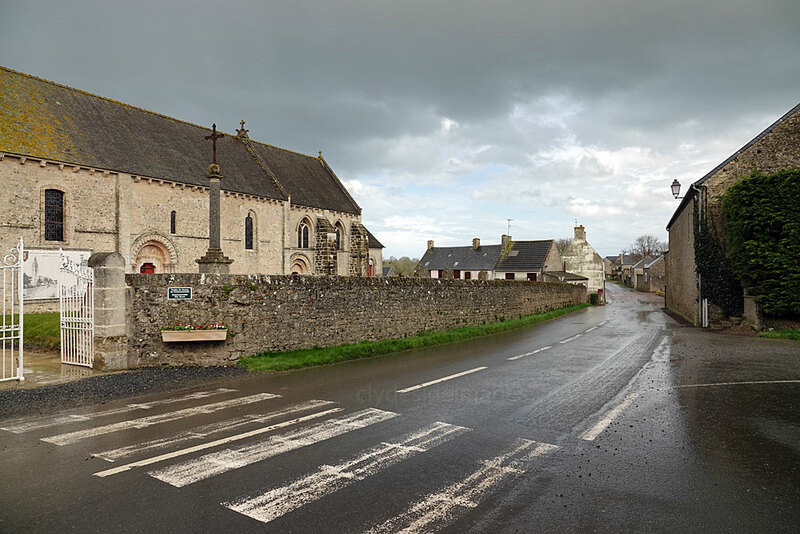 Sleepy Collville-sur-Mer lies just inland from OMAHA Beach, with its most notable feature being its church, Notre-Dame de l'Assomption de Colleville, which dates from the late 12th or early 13th century. 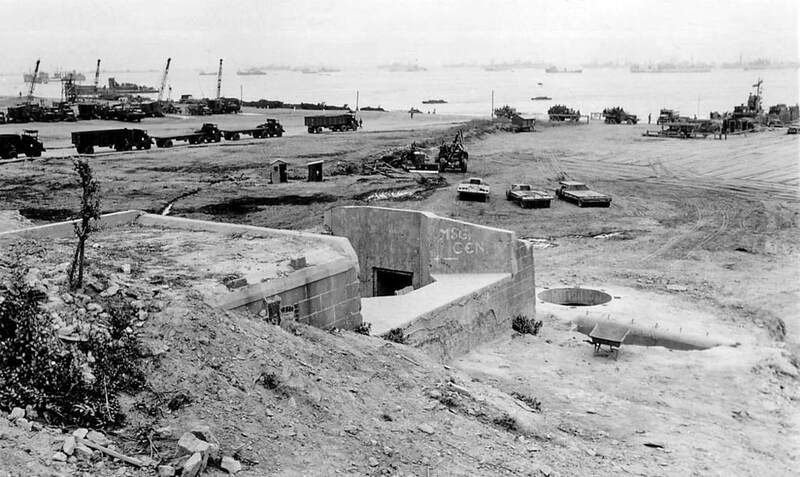 The village and the adjacent stretch of beach were defended by four strongpoints, coded ‘WN60 to Wn 63’. It’s well documented how badly the Americans fared here, sustaining horrendous losses but some elements had gained the plateau by the end of the first day and managed to hold on despite being surrounded and very low on ammo. 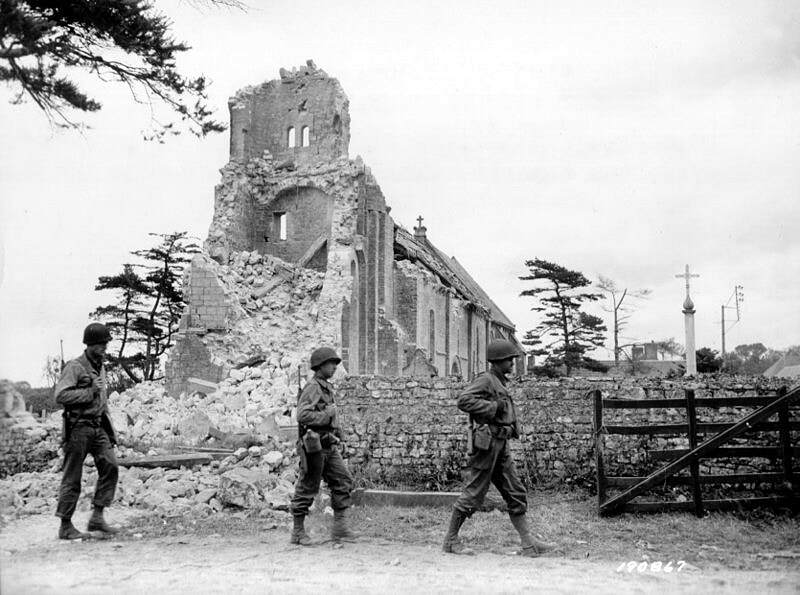 Early on 7 June, 1944, the 2nd Battalion of the 16th Infantry Regiment was tasked with seizing the houses of Colleville-sur-Mer. By 10:00 hrs, US troops had reached the village centre, taking around 70 German soldiers prisoner in the process. By evening, the Americans were in control but they were still at risk from sniper fire. 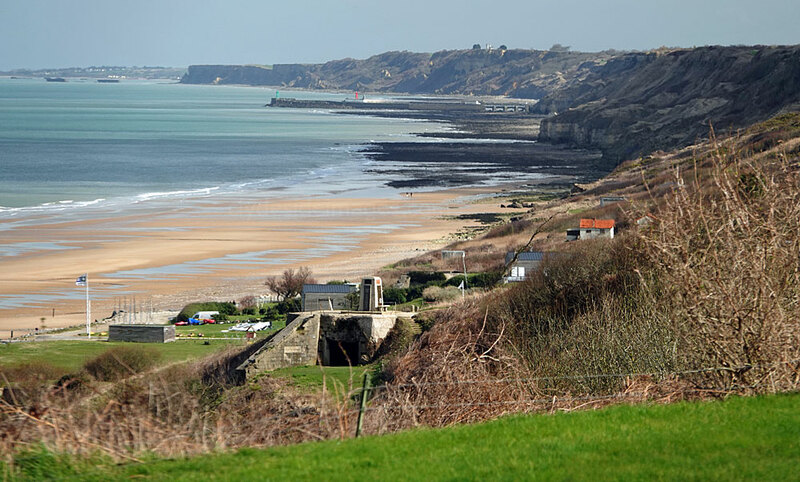 Colleville-sur-Mer was considered secure by the following day and the build up of troops and equipment continued to build rapidly. From that point, tens of thousands of US service personnel passed through these narrow streets as they headed for the constantly expanding front line. 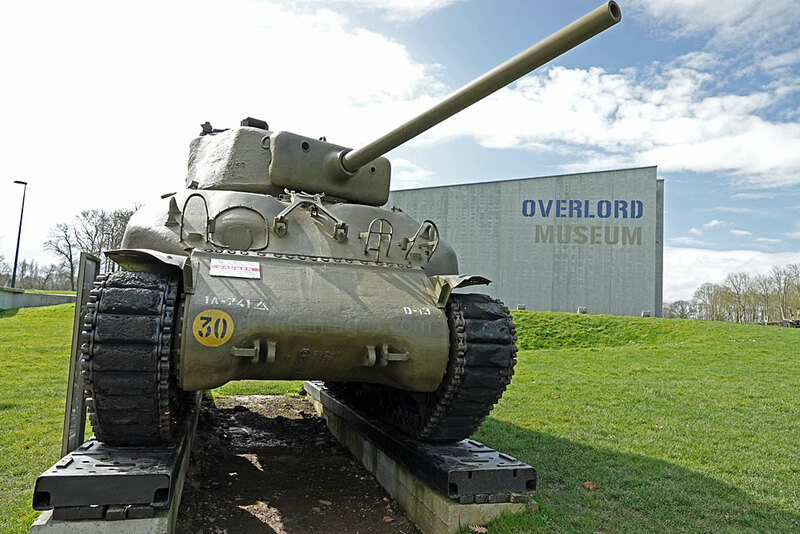 ​The Big Red One Museum, dedicated to the men of the 1st US Infantry Division who landed here, is located in the village, not too far from the entrance to the American Cemetery. 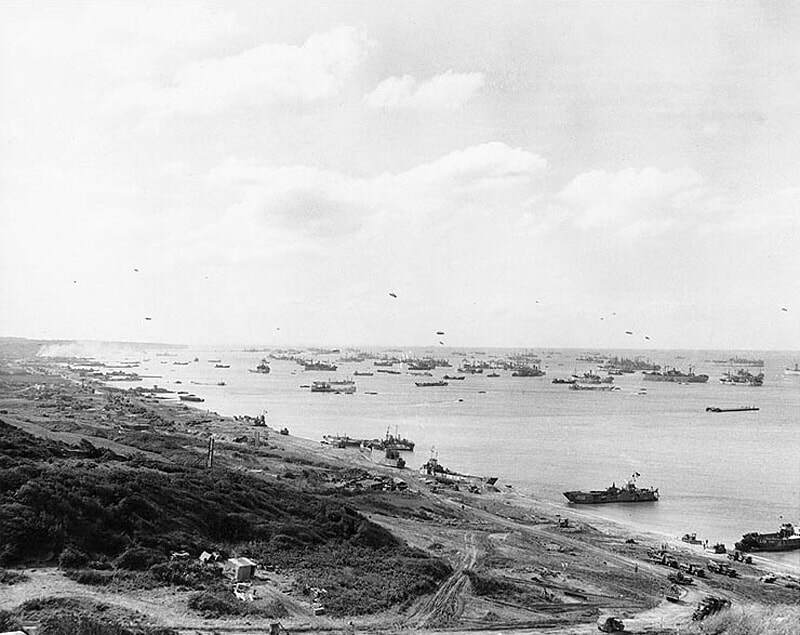 The above photo looks east along OMAHA Beach towards Fox Green sector with various vessels including LSTs, smaller landing craft and a Rhino ferry, all visible. 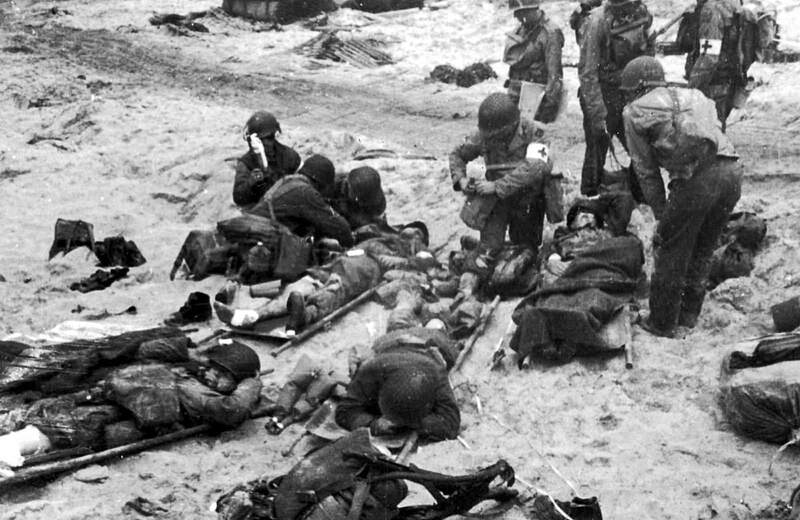 Supplies are piling up on the beach, as are the fallen, several of whom can be seen wrapped in blankets, waiting to join others already unceremoniously loaded on the DUKW, which will take the bodies onto the bluff for burial. The large number of casualties sustained and the enormous amount of equipment lost in securing OMAHA, meant that the American time-line had fallen well behind schedule. 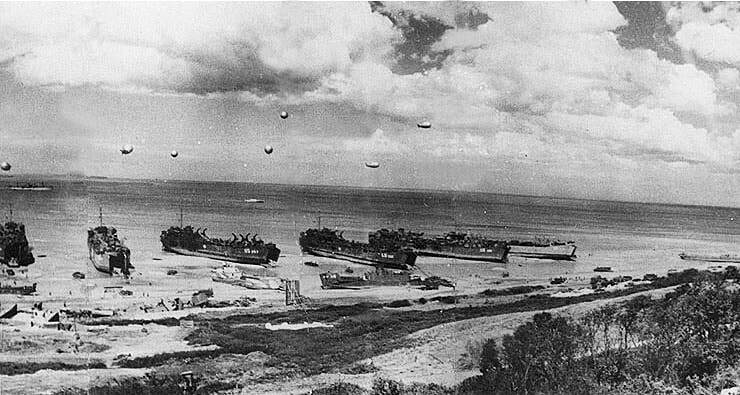 The beach was littered with disabled landing craft, burnt-out tanks and other vehicles making it difficult to land reinforcements. 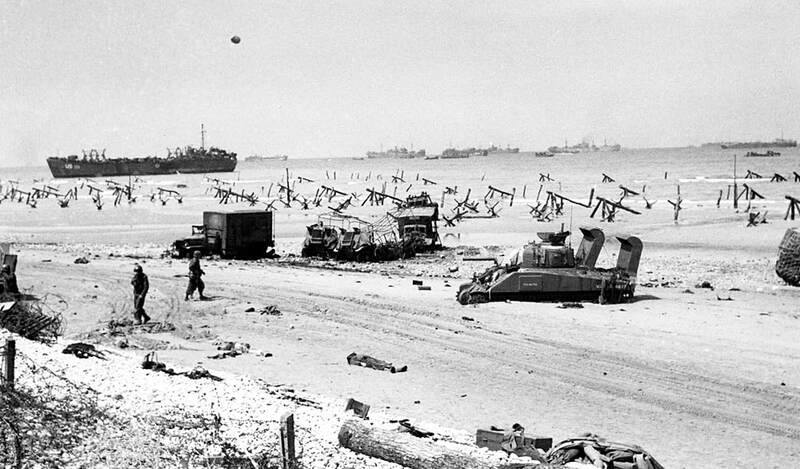 Bulldozers were ideal for much of the clearance work such as opening exits and freeing jeeps and trucks stuck in the sand, however, of the 16 dozers that had been allocated to land on the morning of D-Day, only six made it ashore and three of these were knocked out right away by artillery fire. 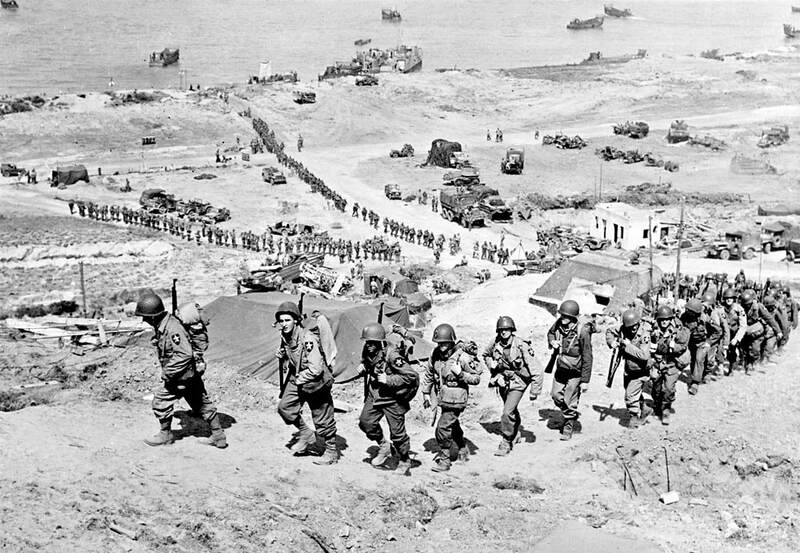 D-Day +1: Men of the US 2nd Infantry Division move inland via the E-1 draw, Easy Red Sector, OMAHA Beach, 7 June 1944. 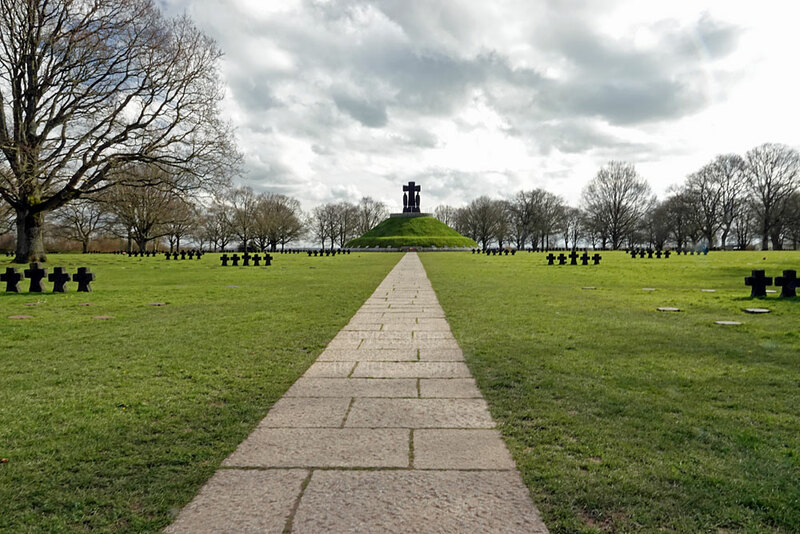 ​Just east of the American Cemetery, on the lower slopes, is a large plinth dedicated to the men of the Fifth Engineer Special Brigade which stands on top of Wn-62, a formidable German strongpoint which claimed the lives of many Americans on D-Day. Above the main panel on the memorial is a plaque to the 6th Naval Beach Battalion which was unveiled on 6 June 2001. 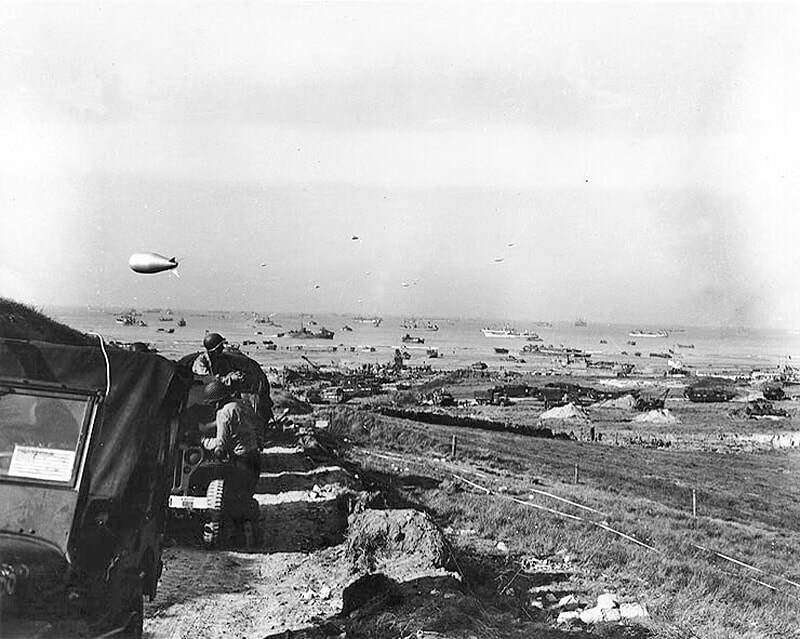 In the above shot, sections of Mulberry B at Arromanches can be seen in the distance. 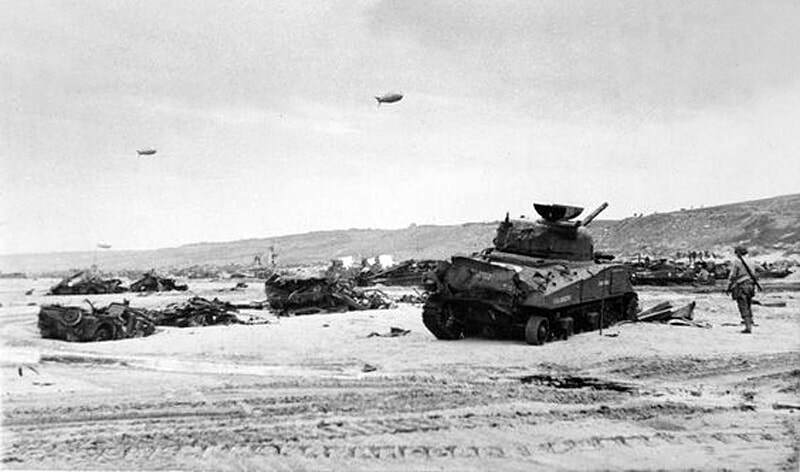 Above: A knocked out Sherman and other vehicles on Dog Green sector. 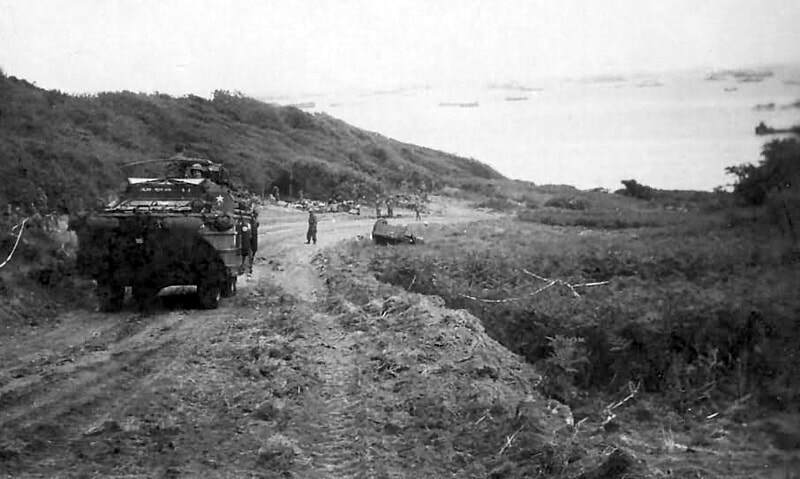 On the right, a DUKW exits the beach via one of the roads created by engineers. 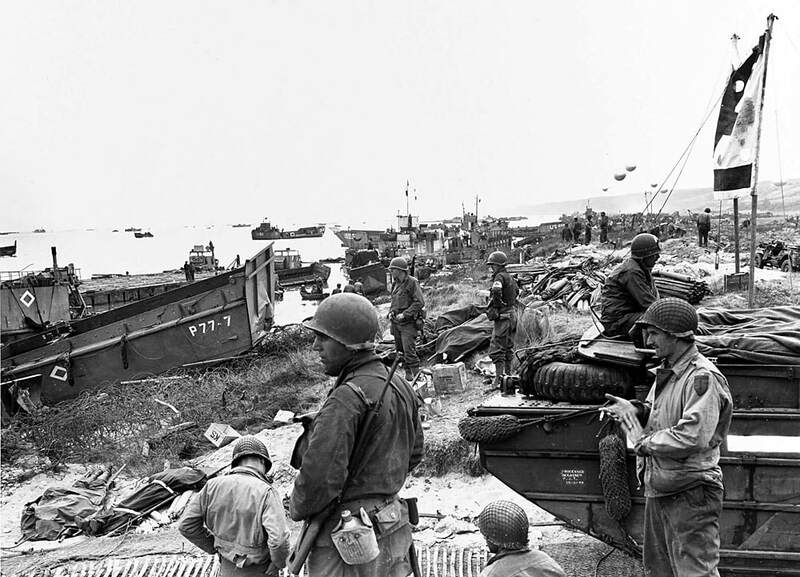 ​Above: The above images, now in the US National Archives, are from 28 Jun 1944 and show LSTs unloading at low tide in the Easy sector of OMAHA Beach. 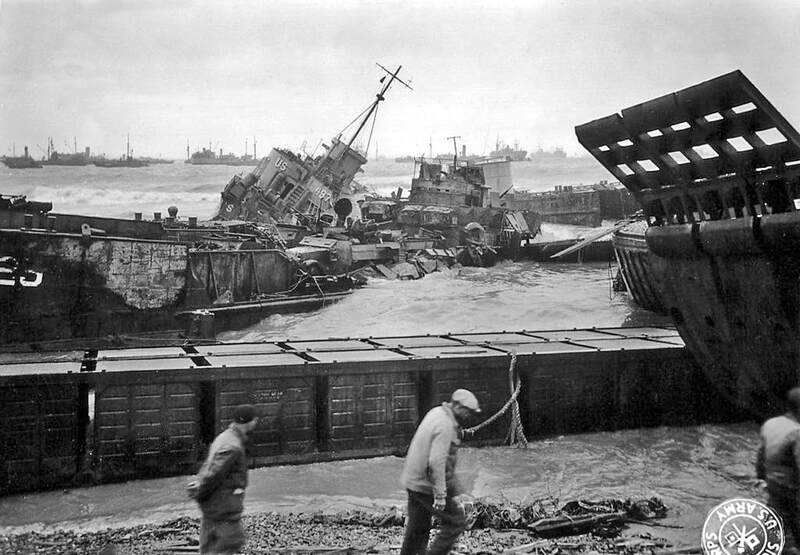 The Gooseberry breakwater of the Mulberry Harbour can be seen in the distance, above left, and there is a wrecked LCI(L) in the centre of the right hand shot. Both photos appear to have been taken from roughly the same spot as those taken on my visit. More shots of the D-Day Signal Memorial at St Laurent-sur-Mer. 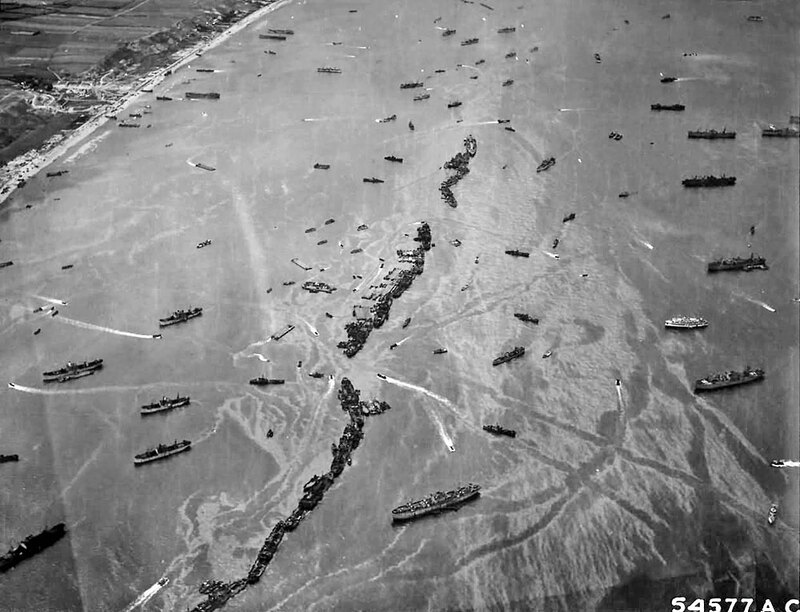 These images from the US National Archives show OMAHA Beach in the days following the initial landings on 6 June. ​Please bear in mind that all images on this website are Copyright. They are not free to use and have been embedded with a digital watermark. Any historic photographs from the Imperial War Museum and other organisations` collections have been used courtesy of a `Share & Reuse` policy and are also subject to copyright restrictions, or are in the public domain. Left: US Army and Navy Commanders waiting for the arrival of other flag officers on OMAHA Beach, Saint-Laurent-sur-Mer, on the morning of 12 June 1944. 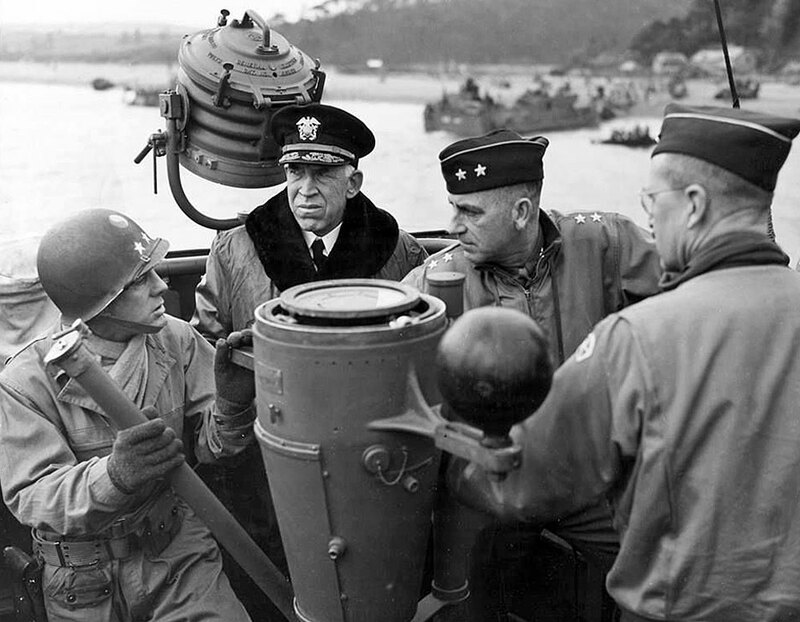 Present are Rear Admiral Alan G. Kirk, US Navy (2nd from left), Rear Admiral John L. Hall, Jr., US Navy (centre, in helmet facing camera), and Lieutenant General Omar Bradley, US Army (far right), overall Allied commander of the Normandy landings. 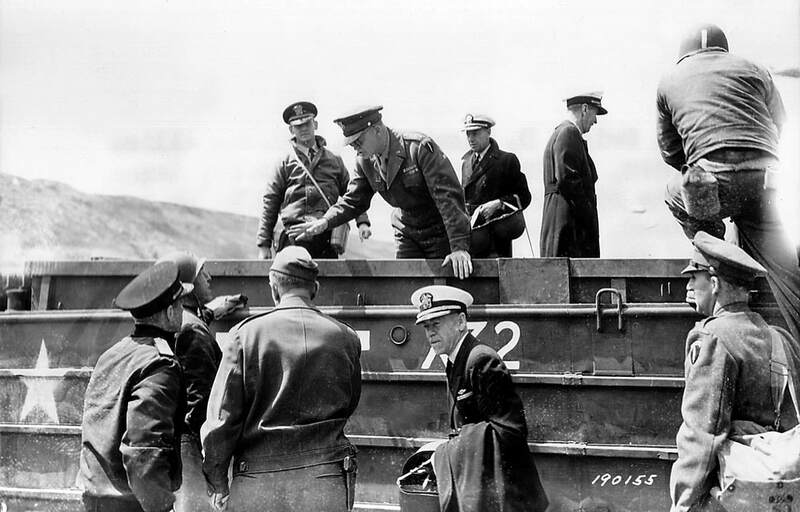 The group were waiting to meet with Admiral Ernest King, General George Marshall, General Henry Arnold, and Supreme Commander General Dwight Eisenhower (above) who were being ferried over from England. ​​The huge Mulberry harbours were intended to provide the primary means for the movement of goods from ship to shore until the port at Cherbourg was captured and opened to marine traffic. The above view of Mulberry A in action was taken on 16 June 1944. 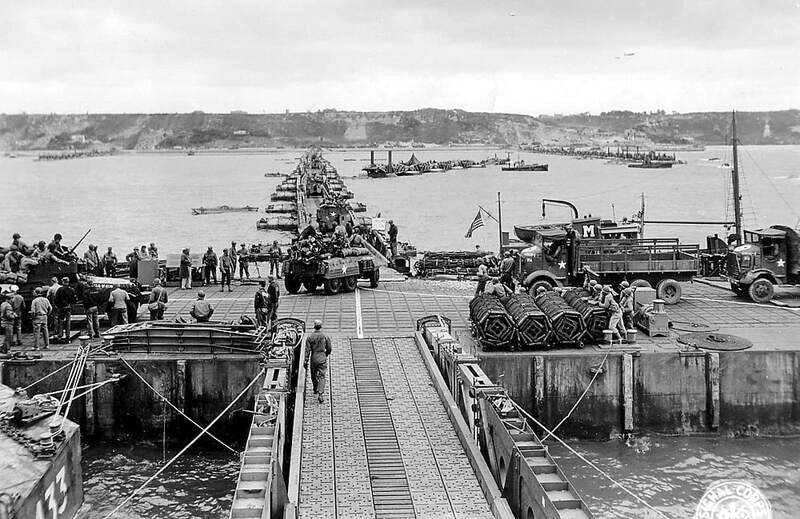 Military vehicles including M3 Halftracks, an M8 Greyhound armoured car, and AFKWX 2½-ton Trucks, move ashore at OMAHA Beach via a pontoon section. 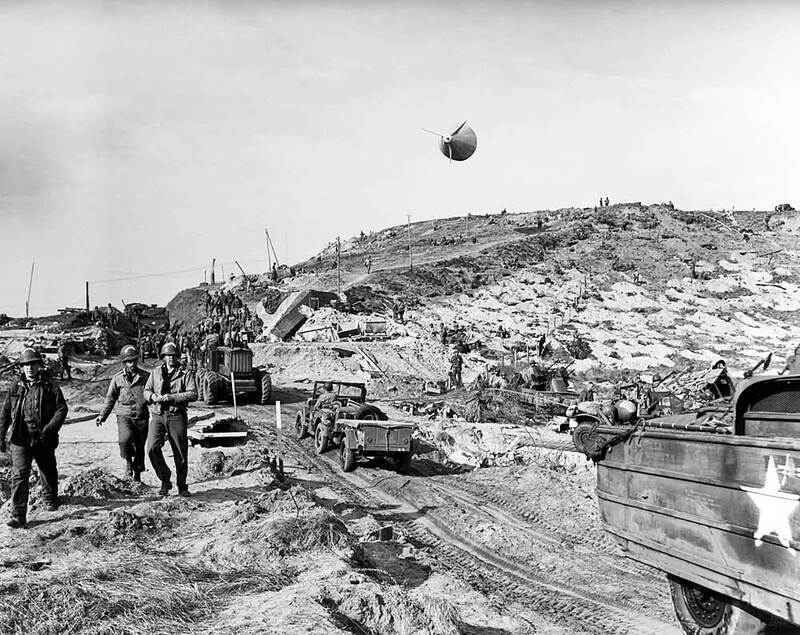 Barrage balloons can be seen in the distance. Unfortunately for the Allies, on June 19 a violent storm began, and by June 22 the American harbour was all but destroyed. 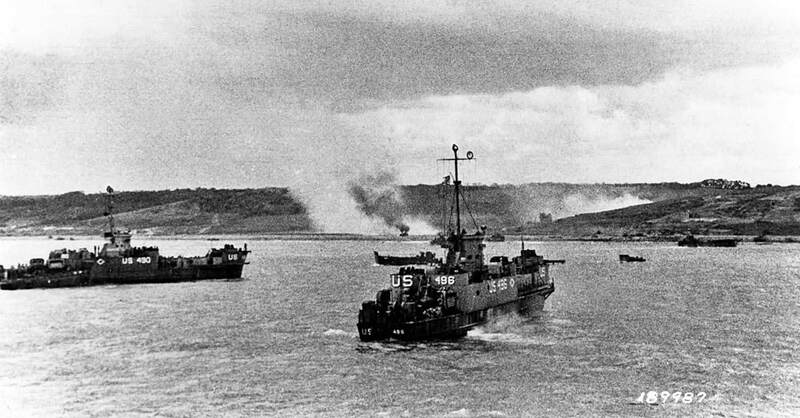 It was abandoned but parts of the wreckage were used to repair the British Mulberry at Arromanches which fared a little better, so the Americans had to return to the old way of doing things: bringing landing ships right in to shore, grounding them, off-loading, and then refloating them on the next high tide. ​The British Mulberry helped support the Allied armies for 10 months. 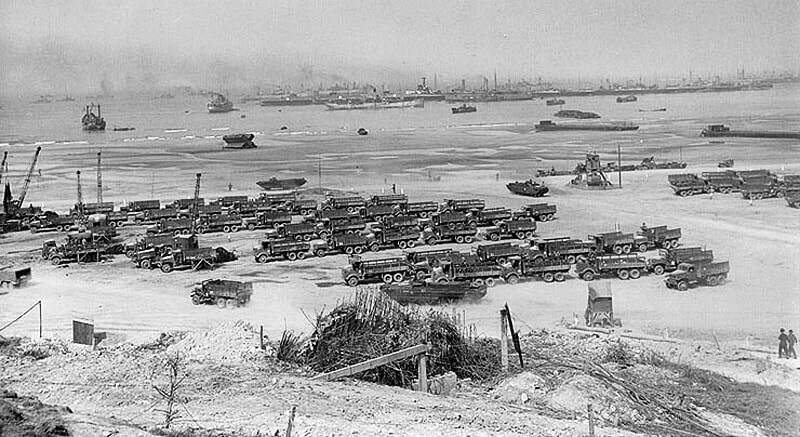 Two and a half million men, a half million vehicles, and four million tons of supplies landed in Europe through the artificial harbour at Arromanches alone. 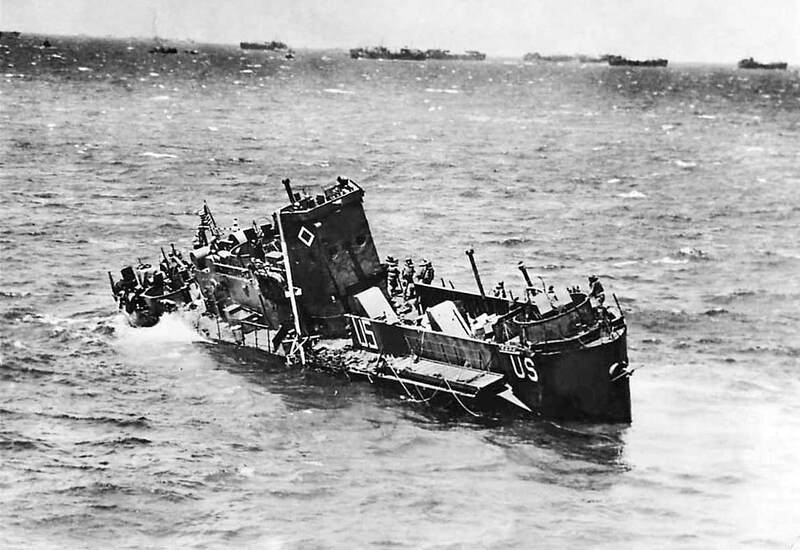 However, some military experts and historians have since argued that landing men and materiel on the beaches via lines of sunken blockships and smaller prefabricated jetties, or beaching directly onto the sand, such as the Americans resorted to at OMAHA, could have been just as efficient while saving a fortune in man hours and money, especially considering the vast cost of construction materials, and difficulties in transporting the finished components to Normandy. Whatever the case, there is no doubt that the Mulberries were a remarkable feat of engineering. 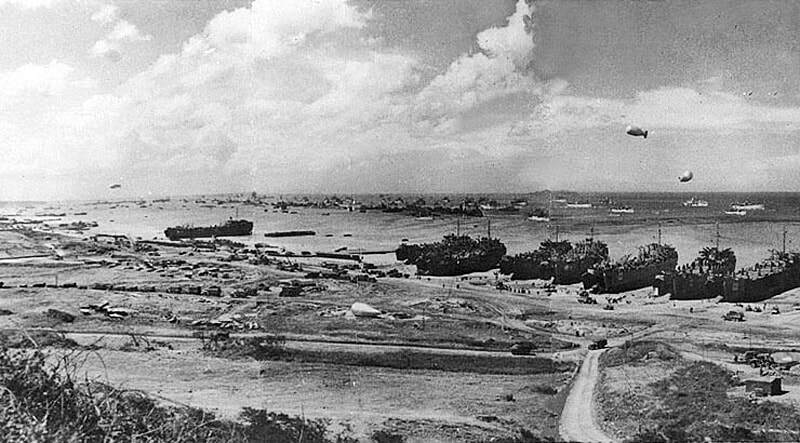 The above view shows the surviving line of blockships at OMAHA with LSTs and numerous Liberty Ships close in to shore. 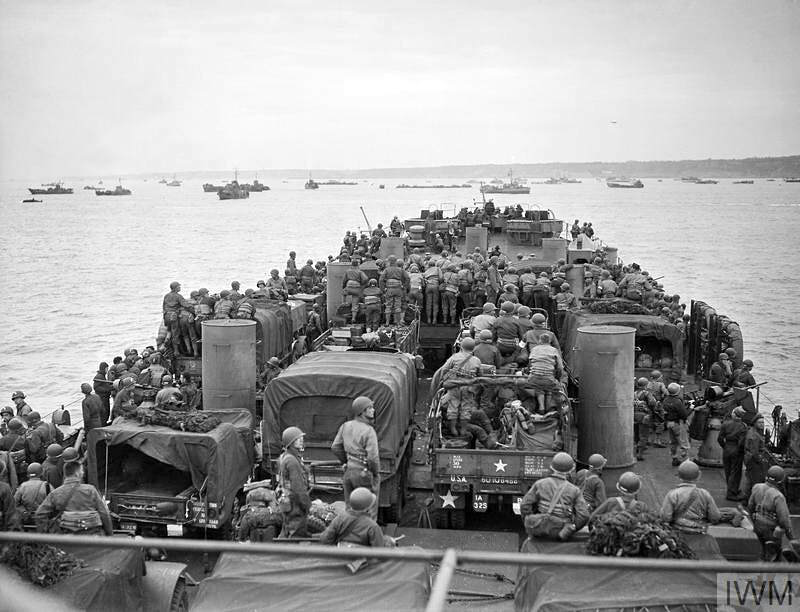 Rhino ferries were used extensively during the Normandy landings, transporting troops, vehicles and equipment from ship to shore as their low draft was well-suited for shallow beaches. They could also be used as piers when filled with water. Basically a barge made up of linked pontoons, Rhinos could be towed by a Rhino tug as seen on the left above, or were propelled by their own outboard engines. 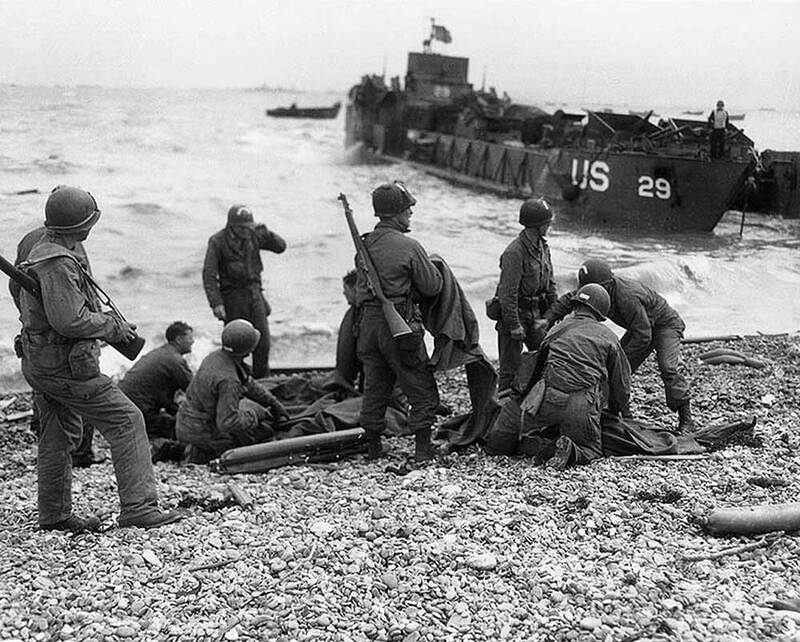 On the American beaches they were usually operated by United States Navy Construction Battalions. 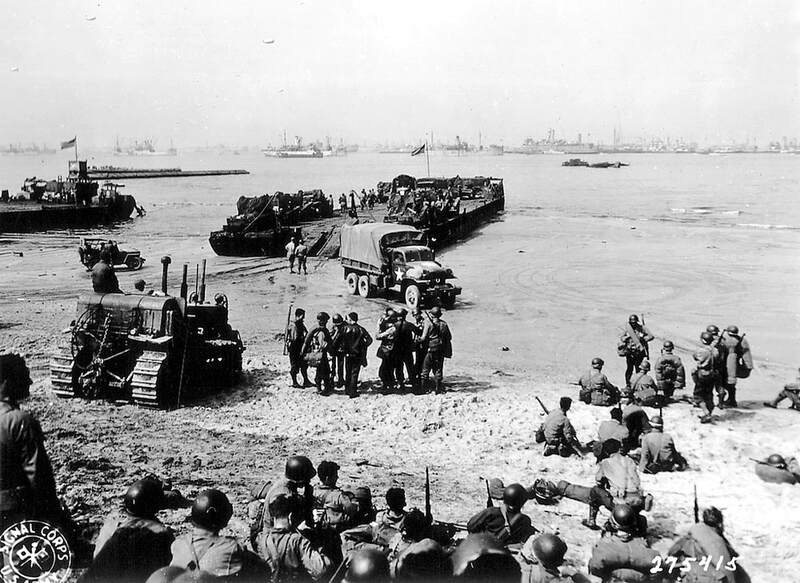 The image on the right above, of trucks stacking up on the beach, was taken in July 1944. A couple of Rhinos are visible offshore.